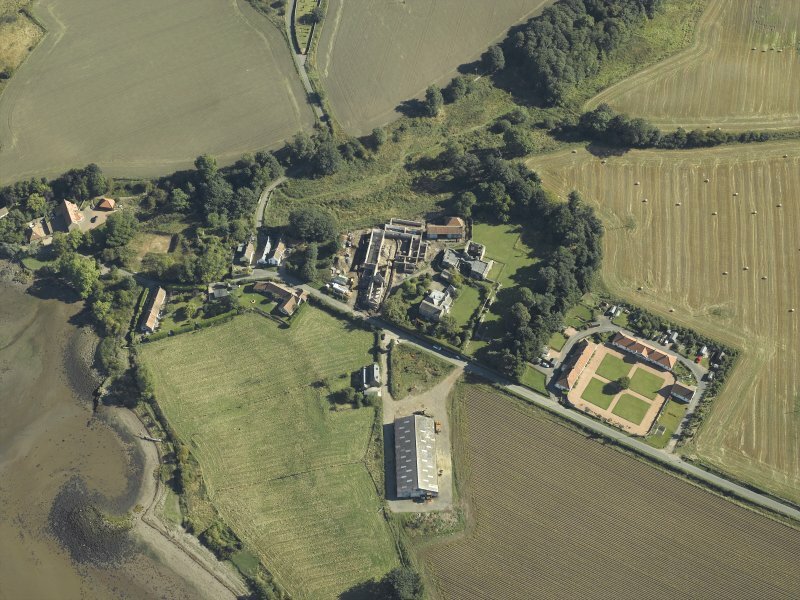 Oblique aerial view of Balmerino, taken from the SSE. 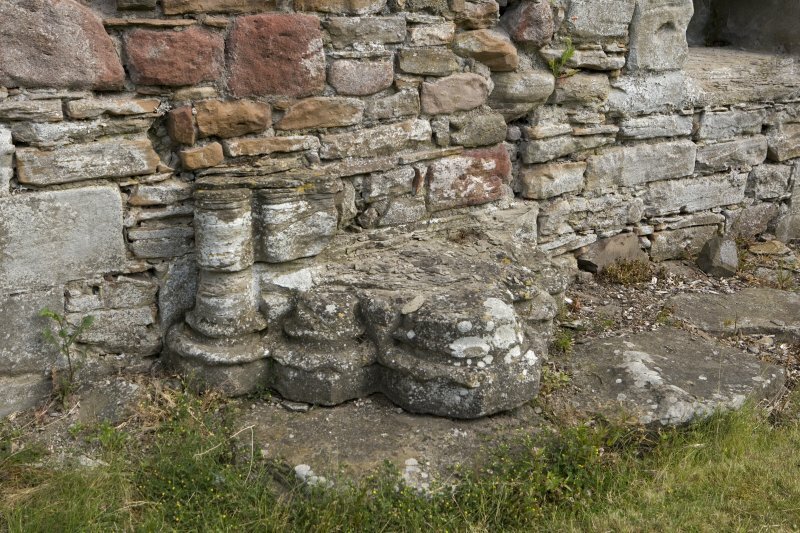 BALMERINO Abbey, view of window seating from S, in N wall of first floor of E range, Commendator's House phase. 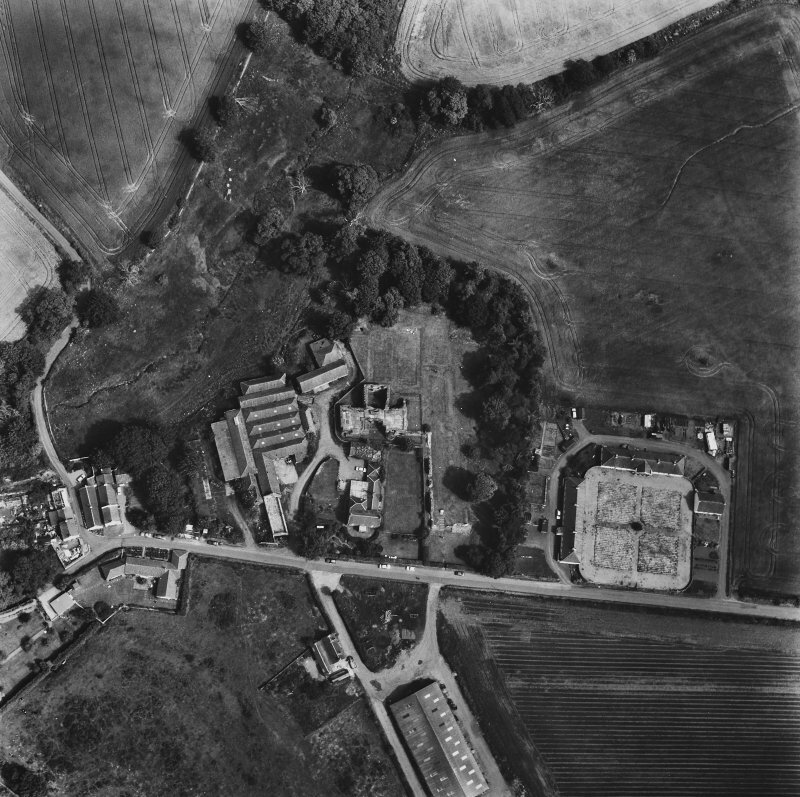 General oblique aerial view centred on the remains of the abbey and church and the farmsteading, taken from the SE. 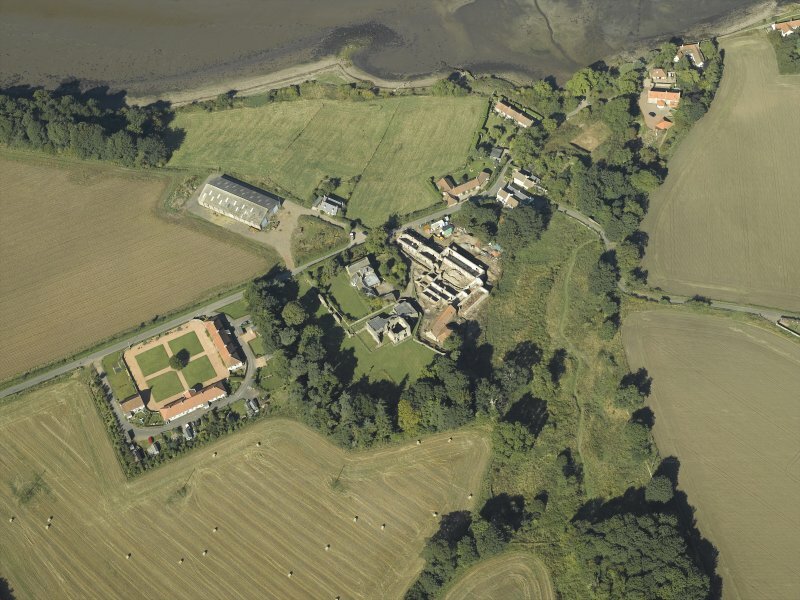 Oblique aerial view centred on the remains of the abbey and church and the farmsteading, taken from the ESE. 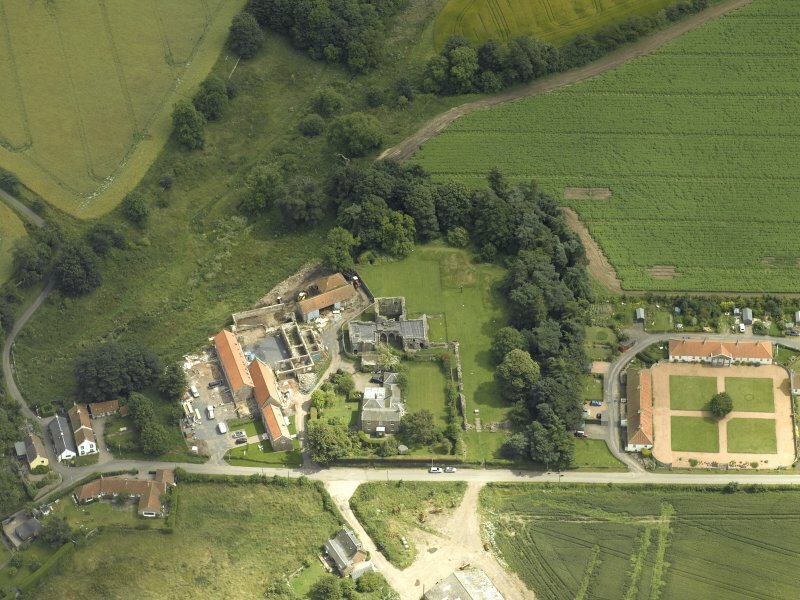 Oblique aerial view centred on the remains of the abbey and church and the farmsteading, taken from the WNW. 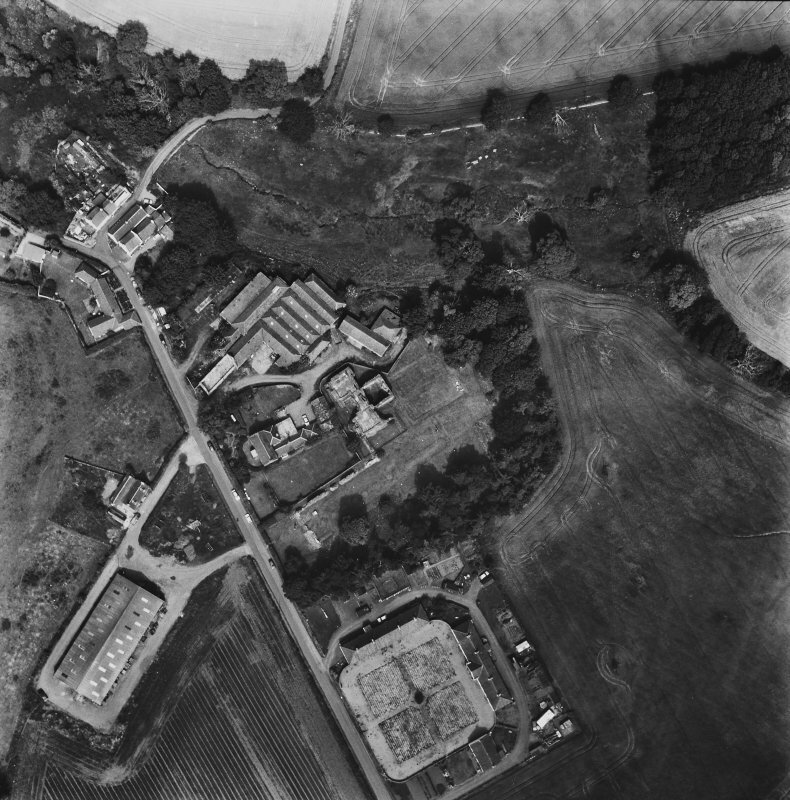 Oblique aerial view centred on the remains of the abbey and church and the farmsteading with the remains of the church and burial-ground adjacent, taken from the S.
Oblique aerial view centred on the remains of the abbey and church and the farmsteading, taken from the WSW. 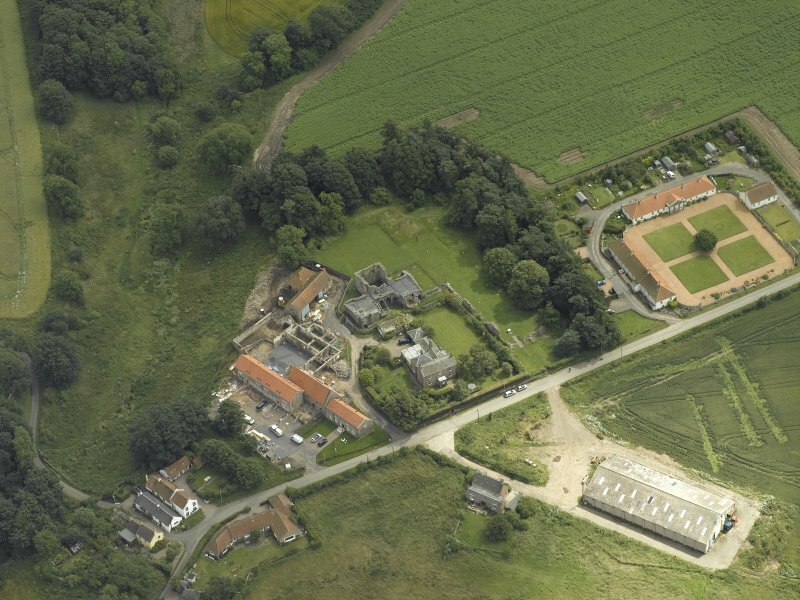 General oblique aerial view of Balmerino, taken from the NW. 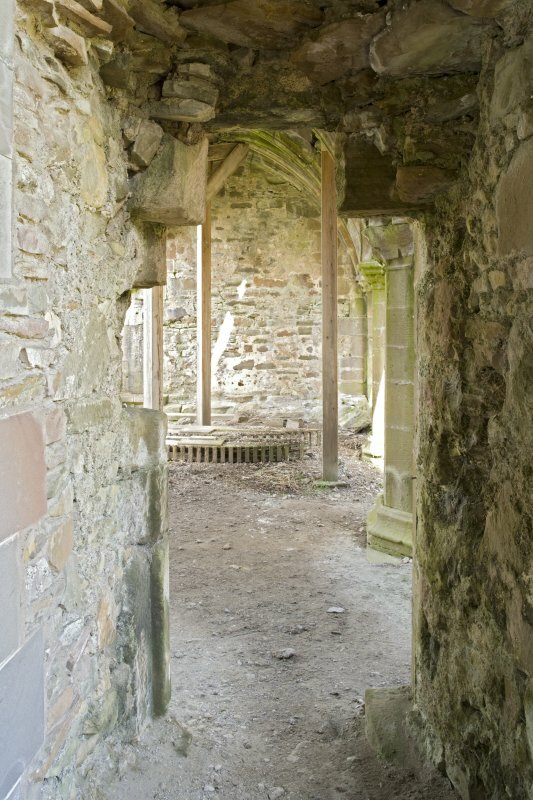 Internal view of the E end of chapter-house taken from the E, showing the arcading of the vestibule and wall of dormitory over. Oblique aerial view centred on the Abbey and church, taken from the W.
Illustration of arcading in Chapter House. 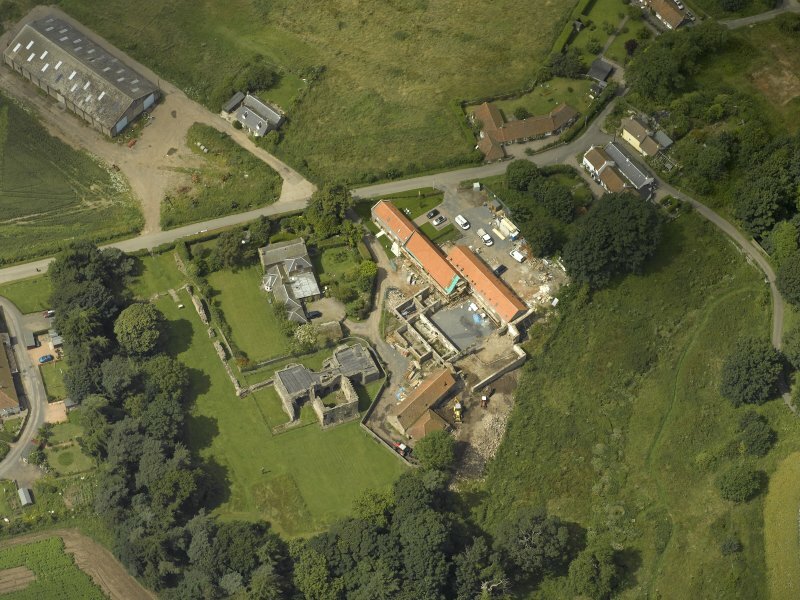 Oblique aerial view centred on the Abbey and church, taken from the N.
Oblique aerial view centred on the Abbey and church, taken from the WNW. 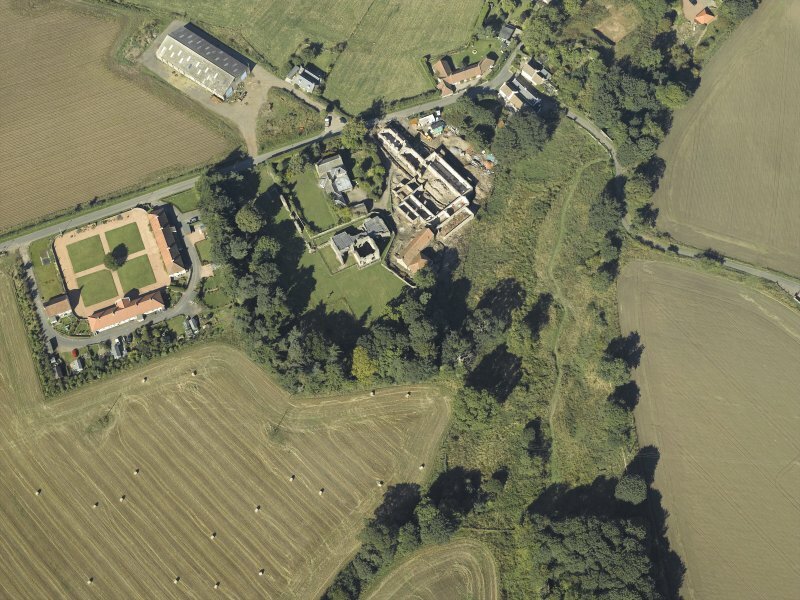 Oblique aerial view centred on the remains of the abbey and church and the farmsteading with the remains of the church and burial-ground adjacent, taken from the NW. 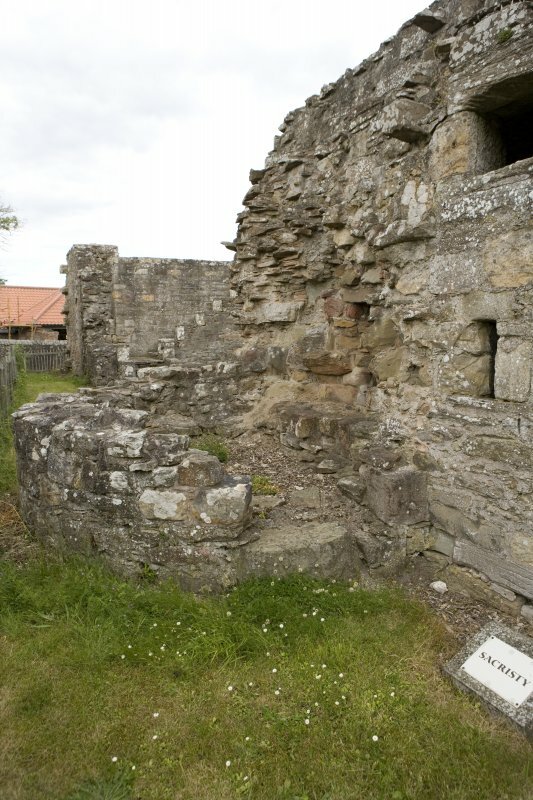 For associated grange (NO c. 360 228), see NO32SE 11.
attested an indenture at Kinloss in September 1229, before the date given in the Melrose Chronicle. 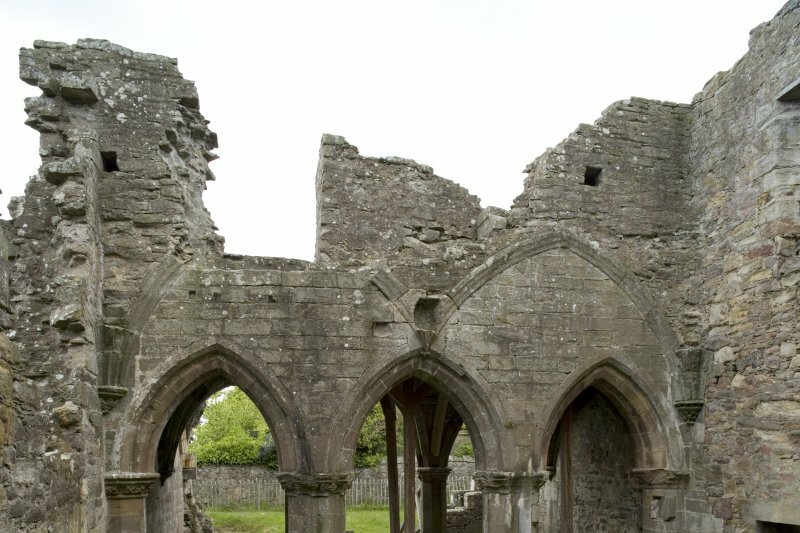 The Abbey was burned by the English in 1547, and further damage was done by Reformers in 1559. The church, dedicated to St Mary and St Edward, was evidently built about the second quarter of the 13th century. A south aisle was added later, possibly c.1286. Only the lower parts of the northern walls are standing, with little more than the foundations of the others, as exposed by excavation in 1896. The cloister lay on the N side of the church. Of its N and W sides, nothing is left above ground, and the E range is reduced in height. 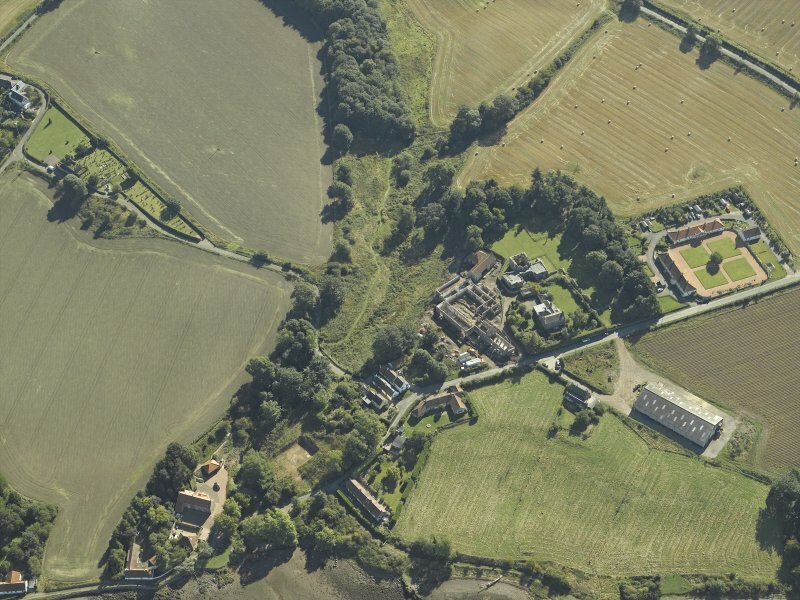 Beyond it on the N and E are the remains of the Abbot's house (NO32SE 2.01), and the barn (NO32SE 2.02). (See RCAHMS 1933 for detailed account). RCAHMS 1933, visited 1927; D E Easson 1957. 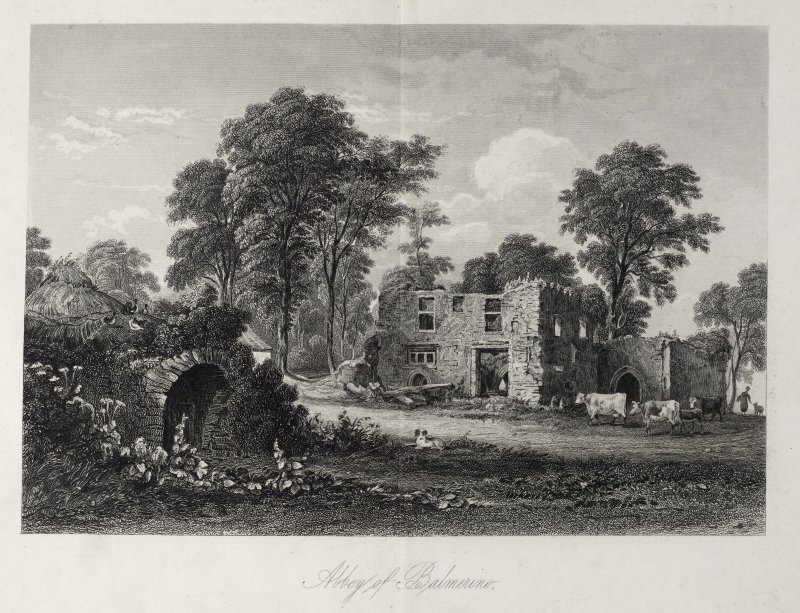 Balmerino Abbey is generally as described. Visited by OS (JLD) 2 November 1956 and (RD) 12 June 1970. Prior to the conservation of the nave of the abbey church, NTS conservation volunteers removed and sorted fallen debris from the walls. This was followed by a photographic survey of the fabric before the inevitable alterations arising from the restoration work. 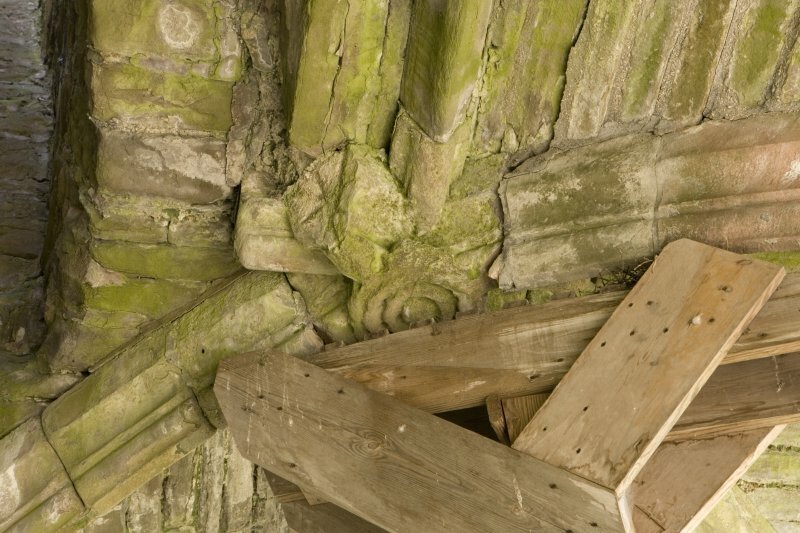 Similar recording will take place as the conservation of the buildings proceeds. Sponsor: National Trust for Scotland (NTS). NO 358 246. 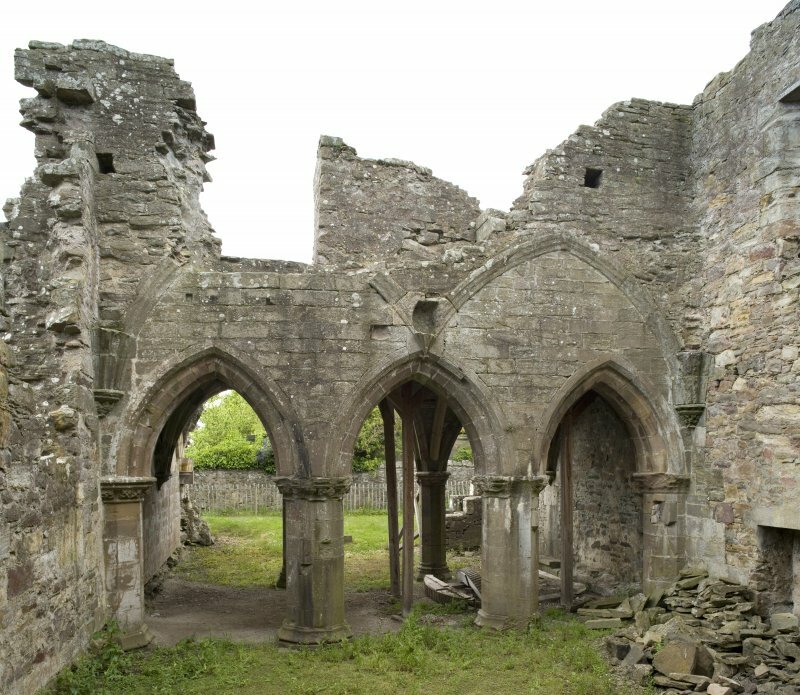 The Cistercian abbey of Balmerino dates from c 1229 and, like its mother house of Melrose, had its claustral ranges to the N of the church. 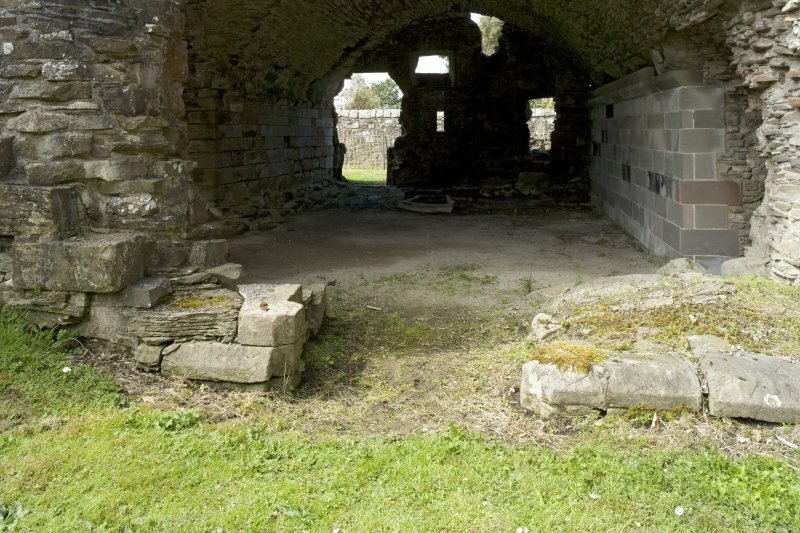 In the mid-19th century a farm steading was erected on the N side of the abbey, probably over some of its demolished buildings and incorporating at least one of the monastic buildings. 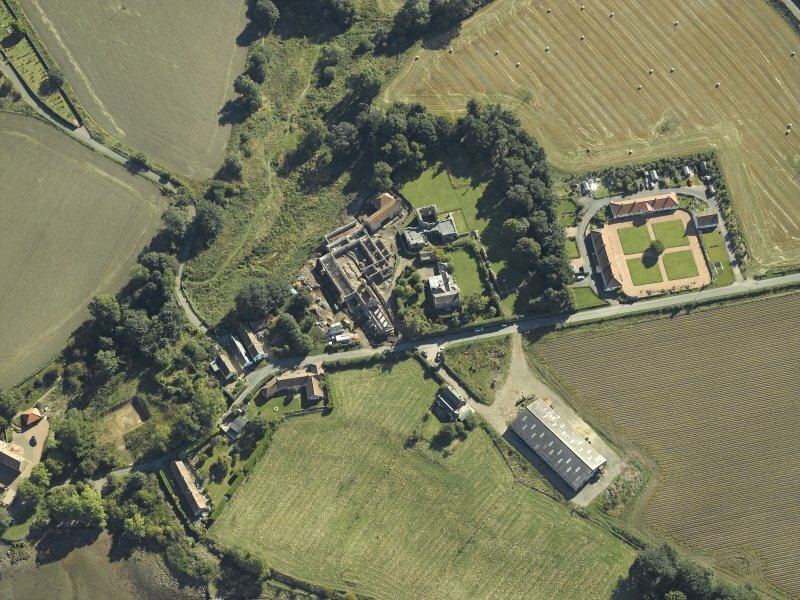 It is the intention to convert the farm buildings into residential units. 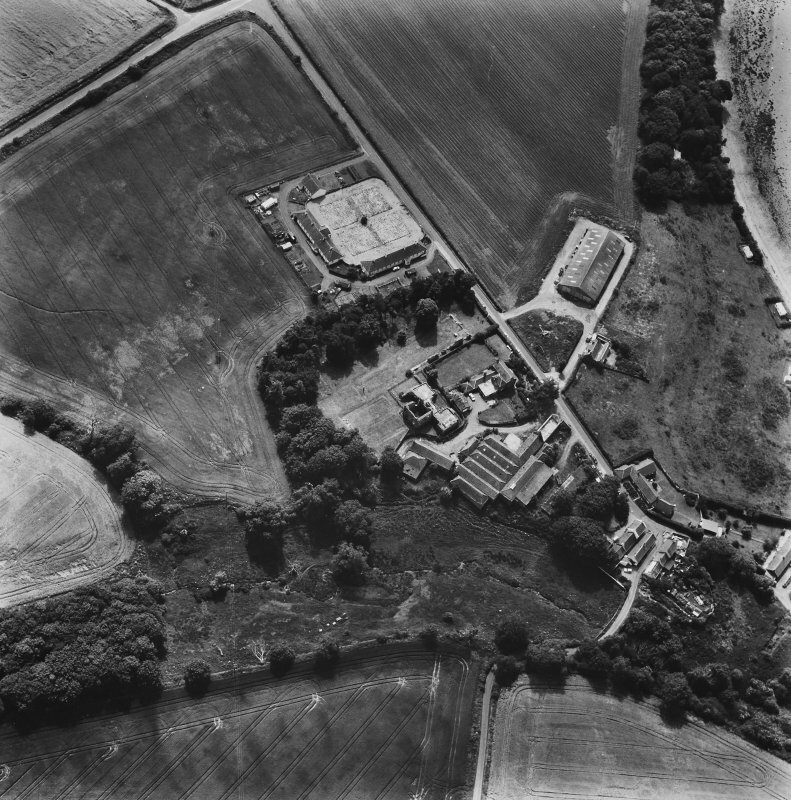 As the first stage of that development, service trenches for water and sewage pipes were machine excavated around the perimeter of the steading, the excavations being carried out under the supervision of Scotia Archaeology Ltd. A large number of structures and features of probable medieval date were uncovered, the most significant of which are described here. At the S end of the farm buildings were several walls of probable monastic origin. 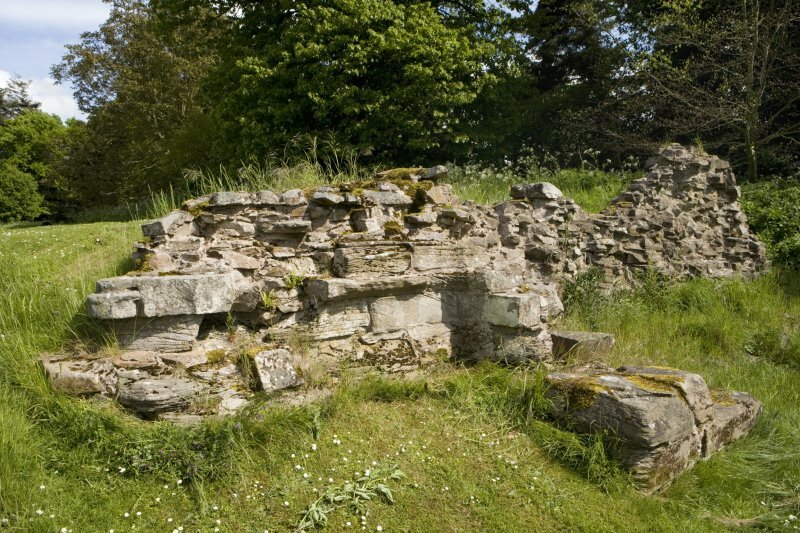 Two were aligned with the E and W walls of the monastic E range and also with those of a farm building further N. What appeared to be a corner of a substantial structure - perhaps the N claustral range or a building associated with it - lay to the W of these excavated walls. Further E a stretch of the great drain was uncovered, running slightly E of N from the E range of the abbey. 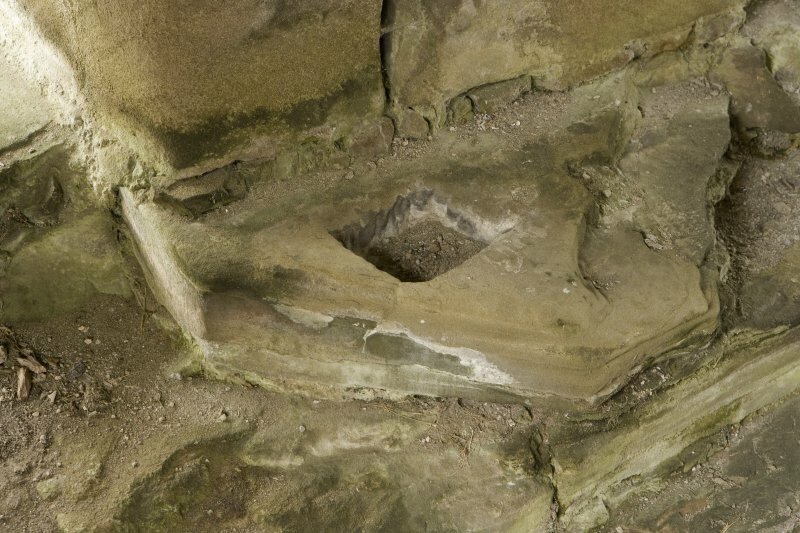 Only the top of the drain (large, roughly worked sandstone flags) was uncovered although it was possible to measure its internal width as about 0.65m; its height was estimated at 1m. 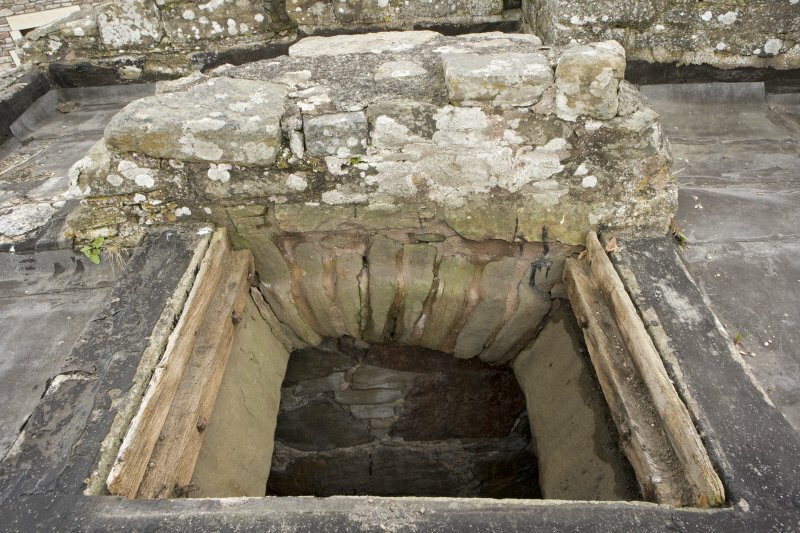 Another, smaller drain led into the great drain from a building beyond the E range of the abbey. One wall of this building was exposed in the extreme SE corner of the site. 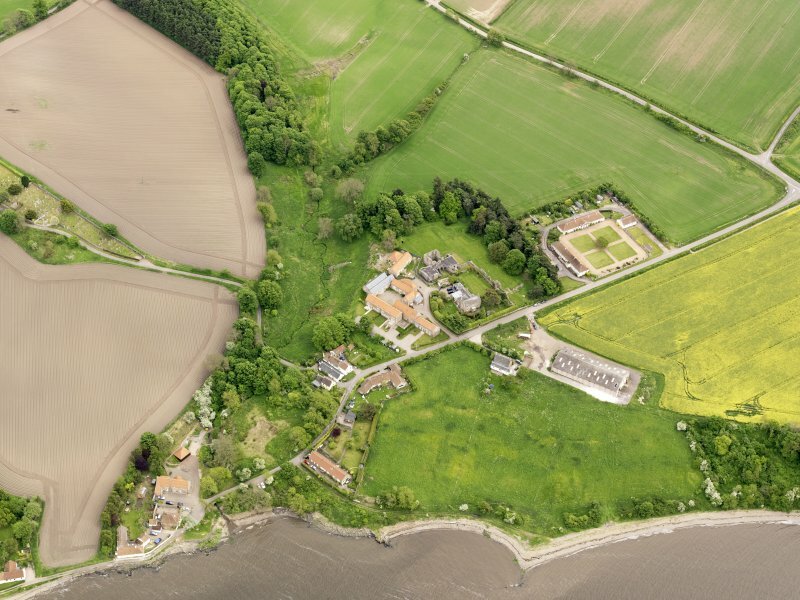 At the N end of the farm was a well-constructed cobbled road, thought to be monastic and probably linking the abbey with a jetty on the shore of the Tay estuary some 200m to the N. The road had pronounced cambers and was 9m wide, more than sufficient to accommodate two-way traffic. More work is planned for the future. Site recorded by Maritime Fife during the Coastal Assessment Survey for Historic Scotland, Fife Ness to Newburgh 1996. Information from Historic Scotland, scheduling document dated 11 June 2010. OS (GIS) MasterMap, August 2010. 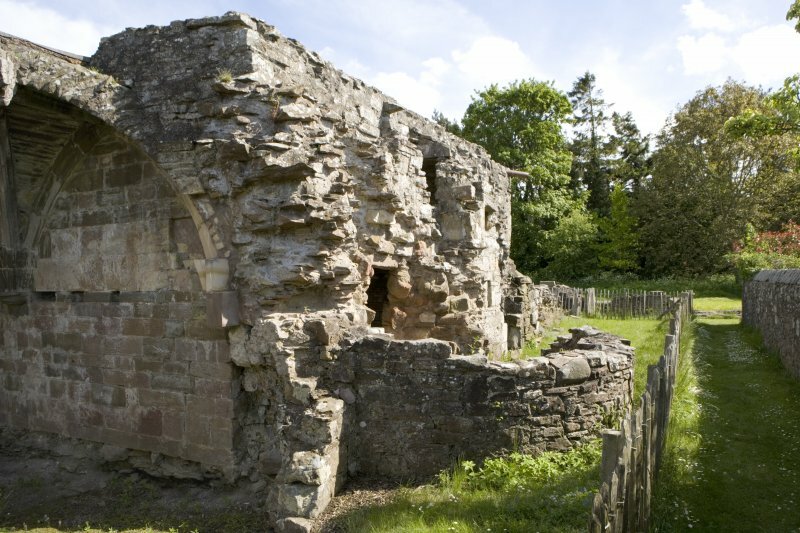 The east range of the abbey is preserved because it was converted to a house, presumably for the commendator, in the 16th century. 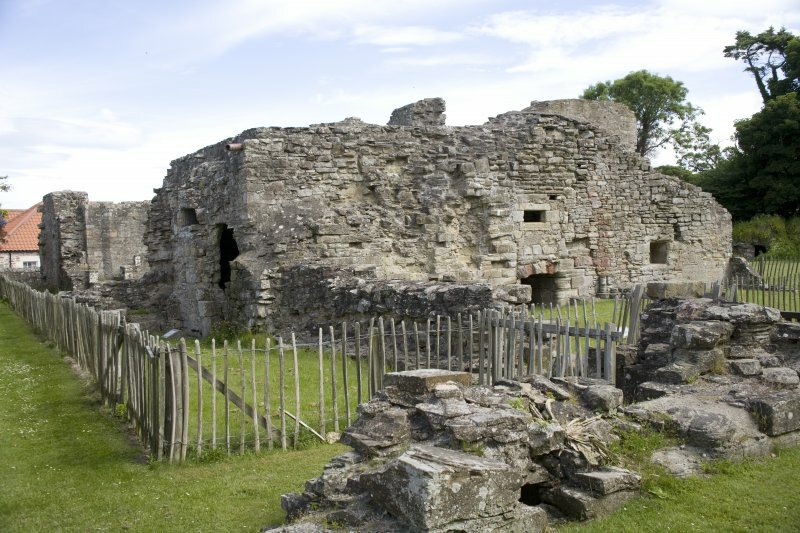 The following will describe first the abbey structures and then the features of the 16th century house. 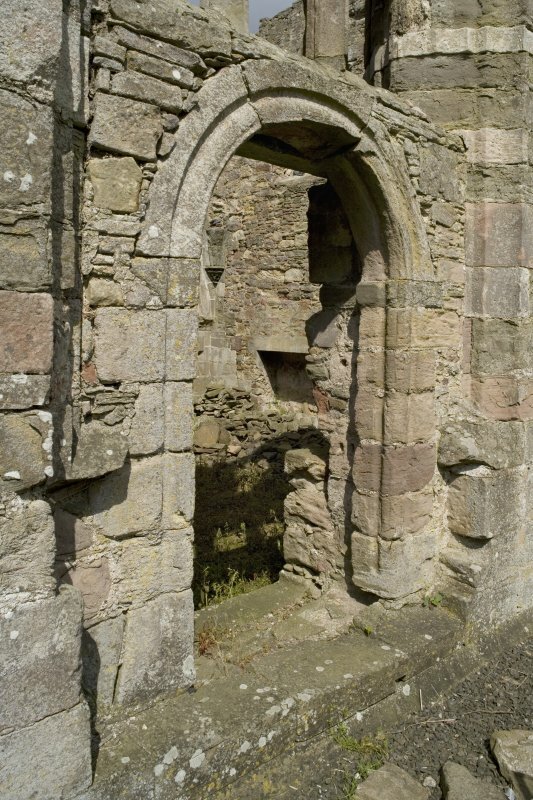 The sacristy was accessed directly from the N transept by a door in the S wall. The opening was 1.5m in width, with broad chamfered voussoirs of grey sandstone. The springer for a Gothic arch still survives on the E, but the head of the arch had been truncated when the entrance was blocked. 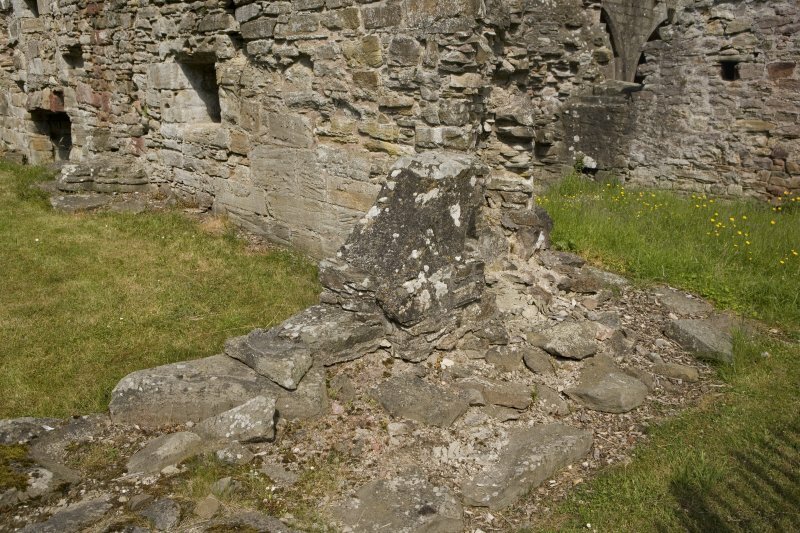 The sacristy is lined on the S with stone benches, and a square hole sunk in the bench on the W side of the entrance, may indicate a timber partition that was inserted to divide the sacristy into a library accessed from the cloister and a sacristy from the church. A shallow circular hollow has been cut into the bench on the E of the entrance. It was presumably lit to E and W by window lights and accessed from the cloister by an entrance, none of which have survived. The present entrances to N, E and W are secondary (see commendator’s house below). The walls are of ashlar, as was the barrel vault in its original form. 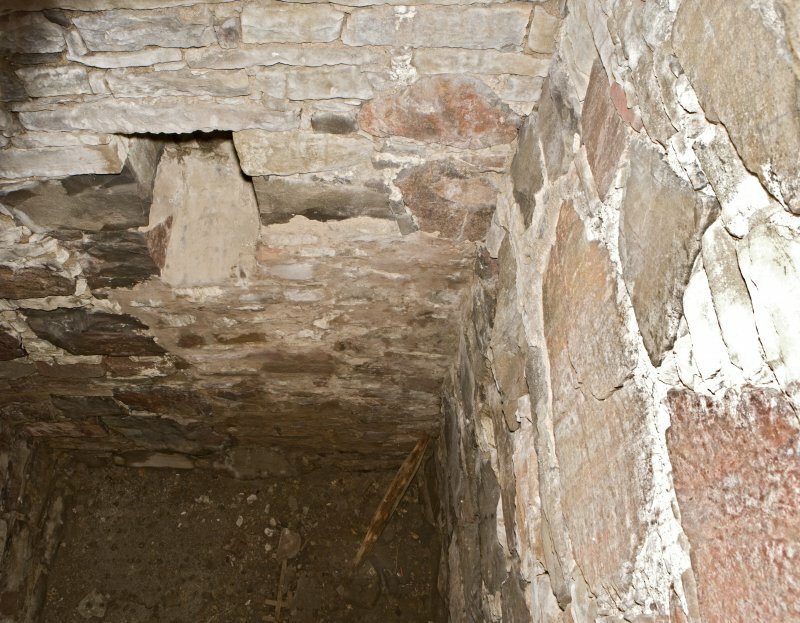 While some of the lower courses of the vault are ashlar, for the most part it had been reworked with thin sandstone wedges, set end-on in the vault. 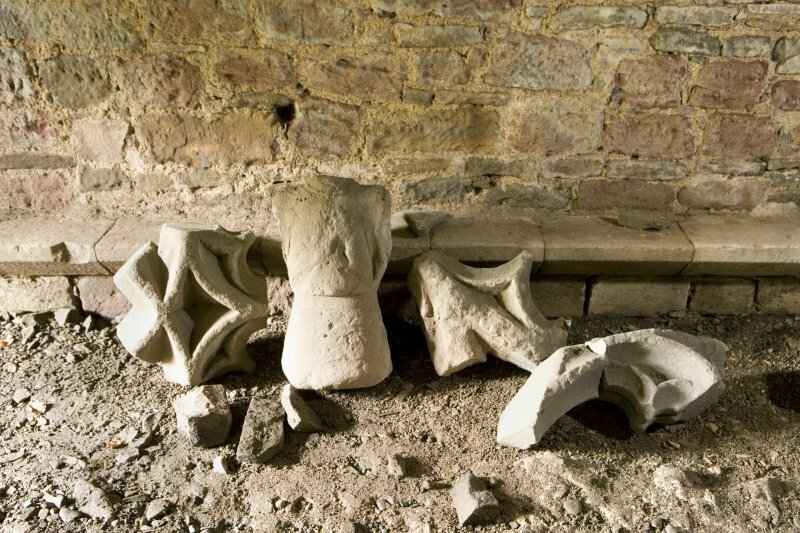 The chapter house has clearly undergone a major transformation in the late-medieval period on the evidence of the ribs of the vaulting and the decorative work on the capitals of the pillars in the vestibule. 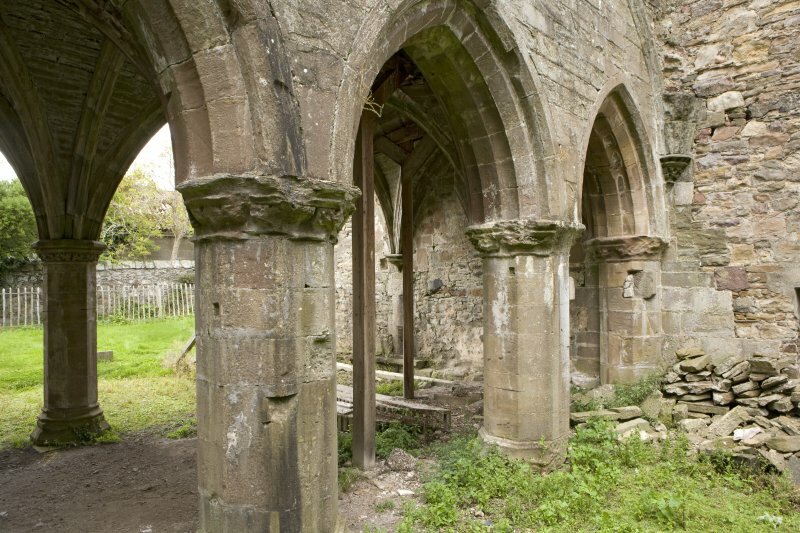 The chapter house in its present form comprises a square vestibule and chamber of matching size (8.3m across internally) to the E. The vestibule had two pillars on the line of the E wall of the E range and two narrower ones in the middle, the W wall having been dilapidated. The six bays or spaces are roofed with ribbed quadripartite vaults. In the extension to the E the vaulting was carried on corbels set high on the walls in the corners and midway along the side walls. 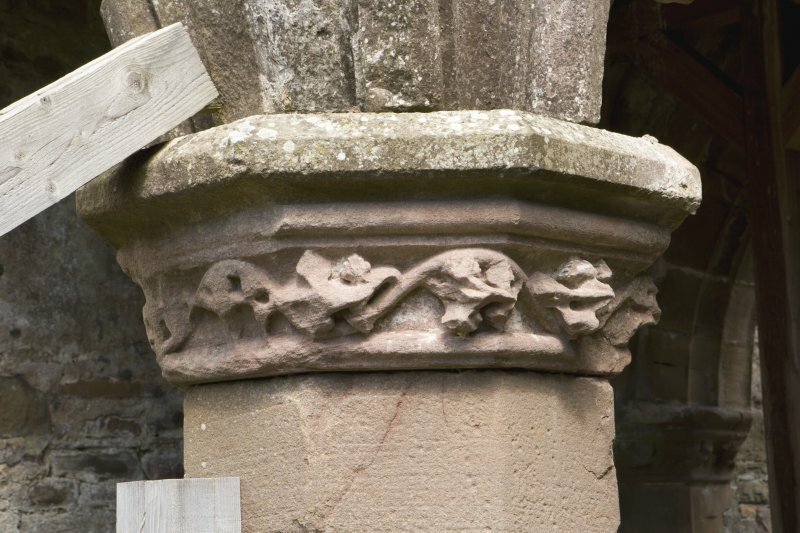 These springers suggest it was supported in the centre by a central pillar now gone. This arrangement can also be seen at Crossragual and Glenluce Abbeys. 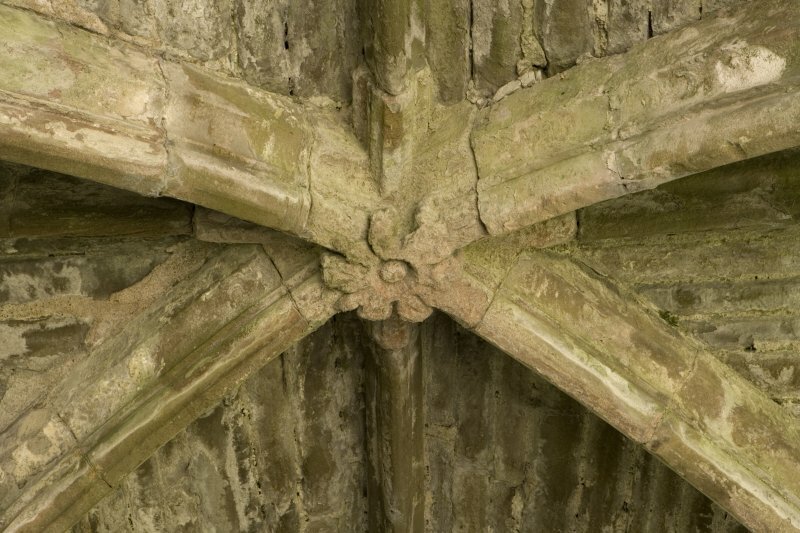 In addition the walls of the extension to the E are not truly aligned at right-angles to the main structure and have thinner walls at 1.1m in thickness as opposed to the 1.5m of the N wall that matches that of the sacristy/transept wall. 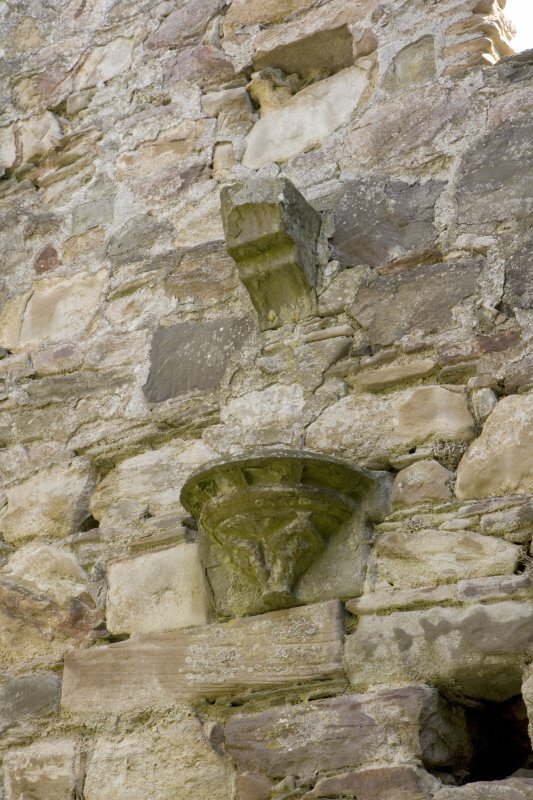 The quality of the external stone work of the N and E walls of the chapter house extension uses the same dressed ashlar sandstone stone as in the N transept and sacristy, and suggests that it was taken from elsewhere to reuse in the walls. 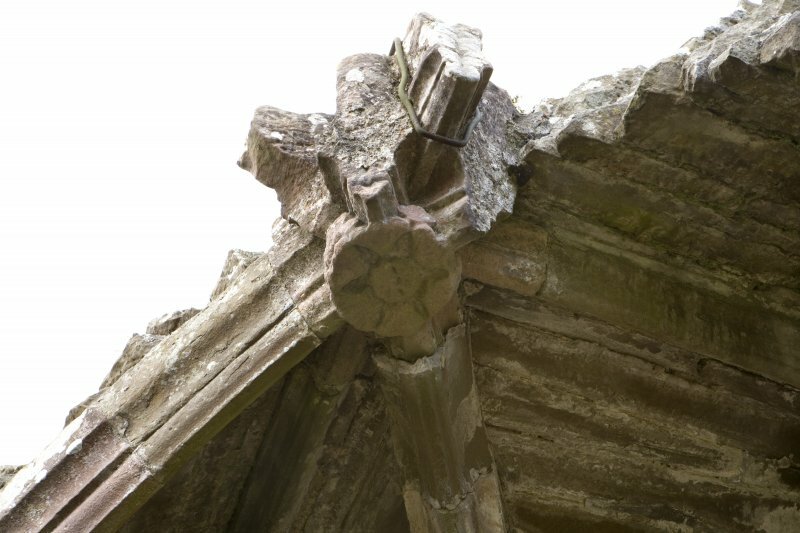 The S wall of the extension consists of rough coursed stone with three evenly spaced joist holes 1.9m apart that presumably supported the weight of an external structure such as a lean-to. 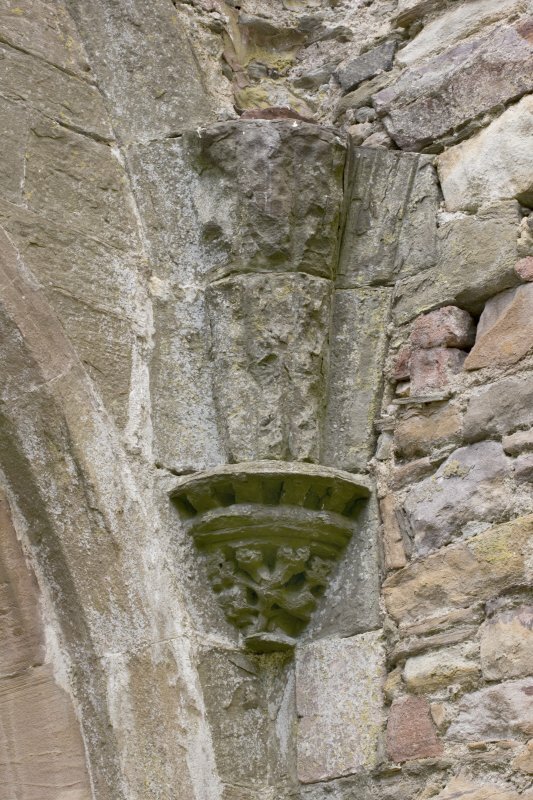 The lack of any dressed stonework in this wall suggest it was completely rebuilt on a different occasion to the rest of the chapter house, such as the collapse or removal of the vault that occupied the business end of the chapter house. 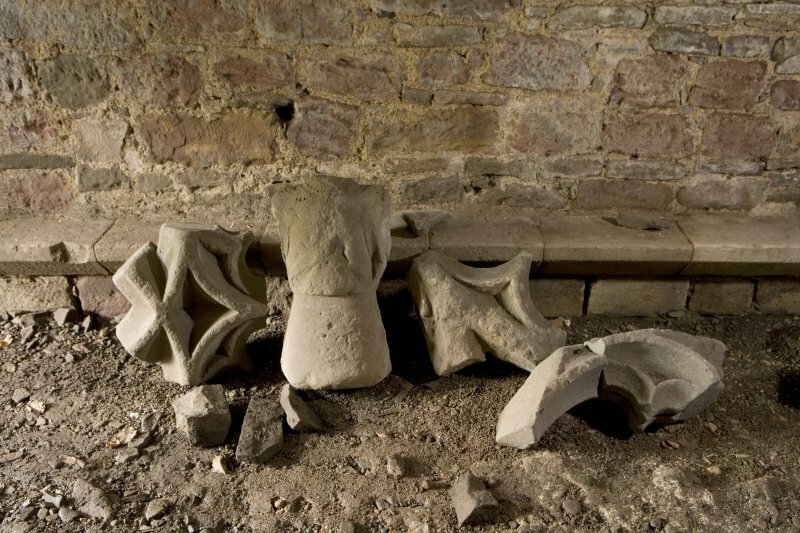 The broken remains of bench seating may be seen along the E and S walls and fragments along the N and S walls of the vestibule, but no sign of any architectural feature to emphasize the Abbot’s status. The chapter house was lit by two large mullioned and transomed windows that fitted within the ambit of the ribs of the vault. 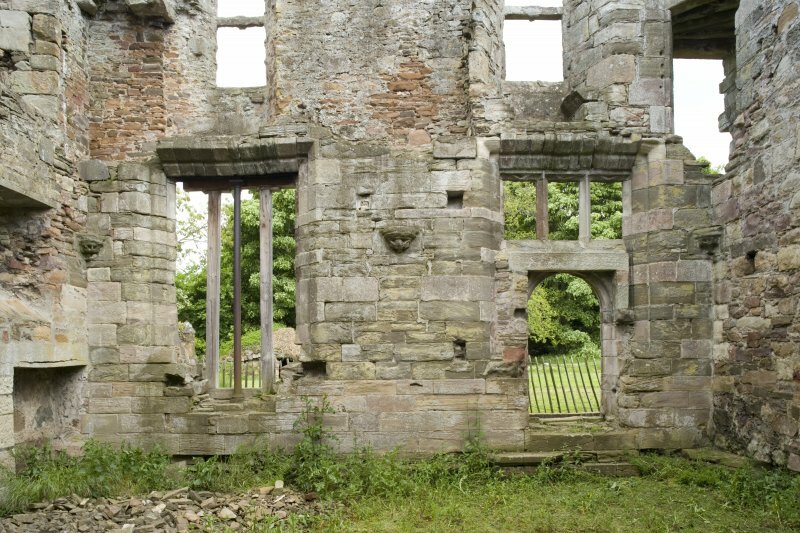 Similar mullioned windows are to be seen at Dunfermline Abbey and Dunblane Cathedral. 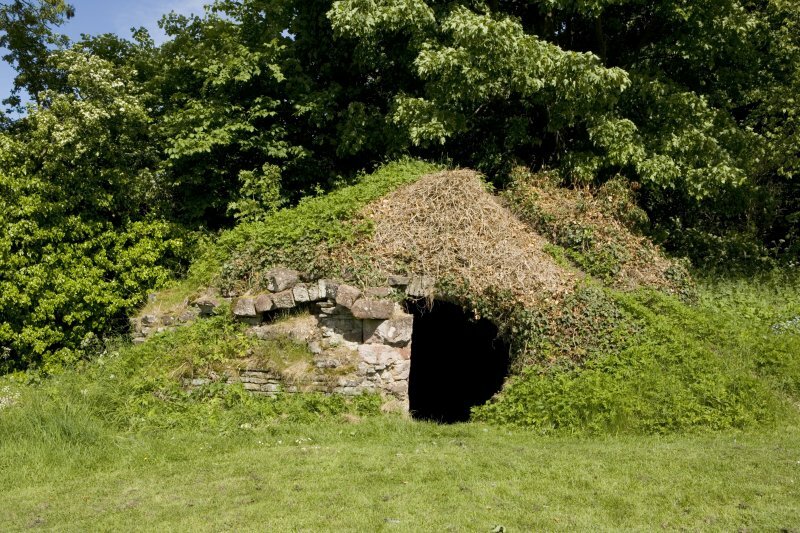 That this was a stone vault is indicated by the raggle of rough stone above the corbel in the NW and SW corners. Its absence in the E wall is due to a re-facing of the wall after the removal of the vault. 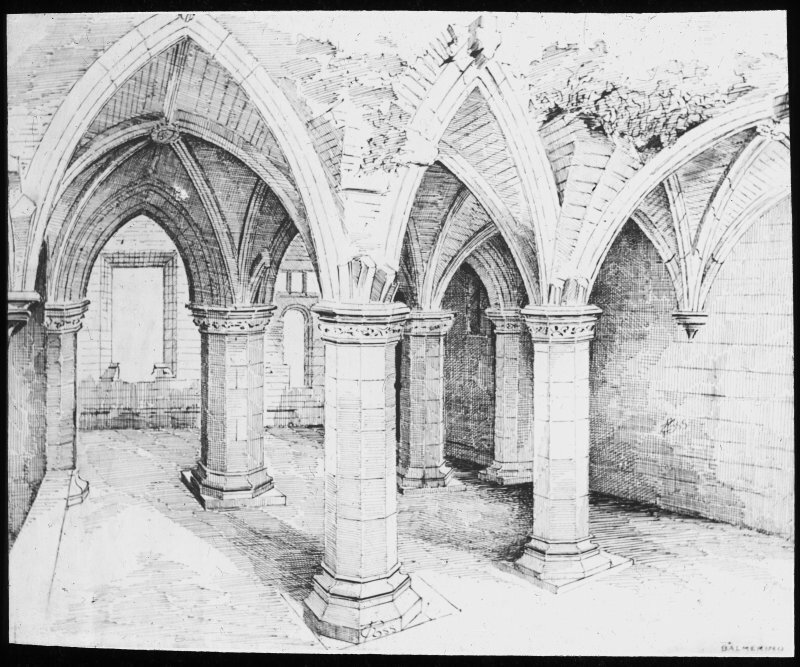 The slype or passage lay N of the chapter house. 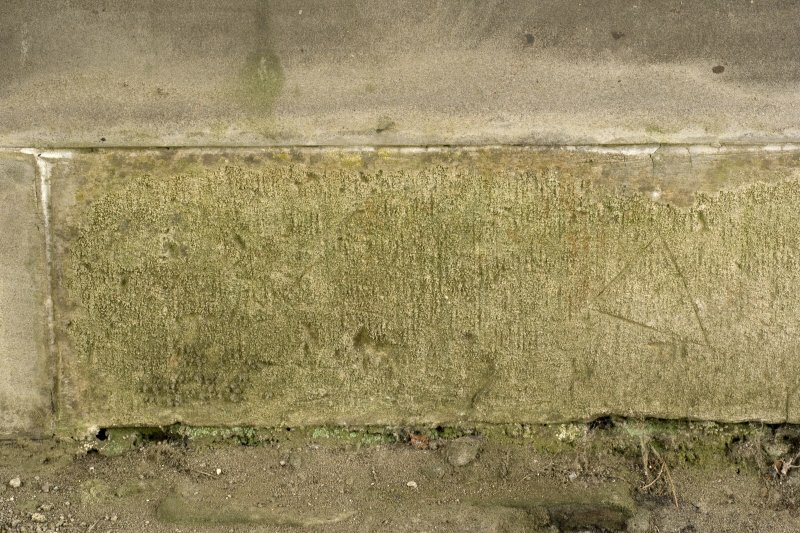 Its walls on the S, N and W were 1.5m thick except on the E where they were 1.2m. This is a clue to the reworking of the N end of the range in the 16th century. The passage originally had openings at either end. That to the W has been robbed of its quoins and blocked off, but the E end has been rebuilt and the architecture of the opening suggests a late-medieval date with the shallow segmented arch taking the weight of the wall and a gothic arch comprising a quirked roll moulding surmounted by a hood decorating the exterior. 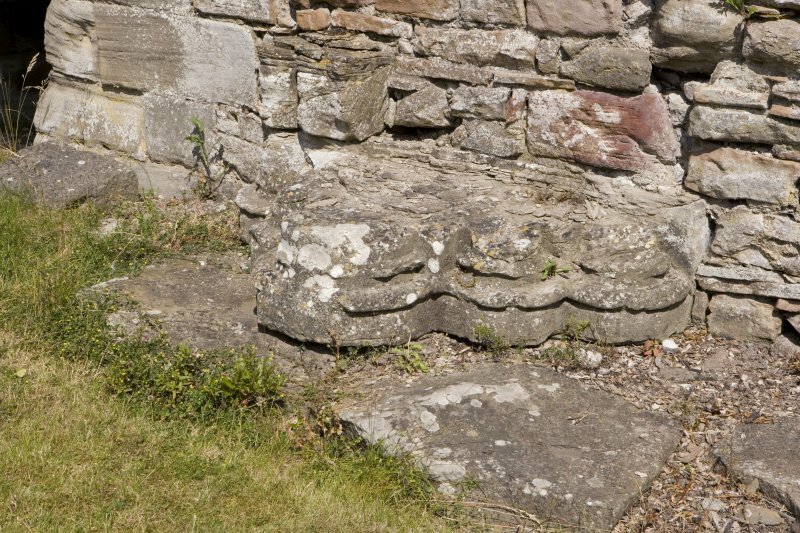 Broken traces of benches can be seen along either side and at the W end of the S wall at the springing of the vault there are the ends of the steps of the night stair that led up from the cloister to the dormitory. Above this the rises a barrel vault which may be original since it is made with dressed stones, though not all of similar size. 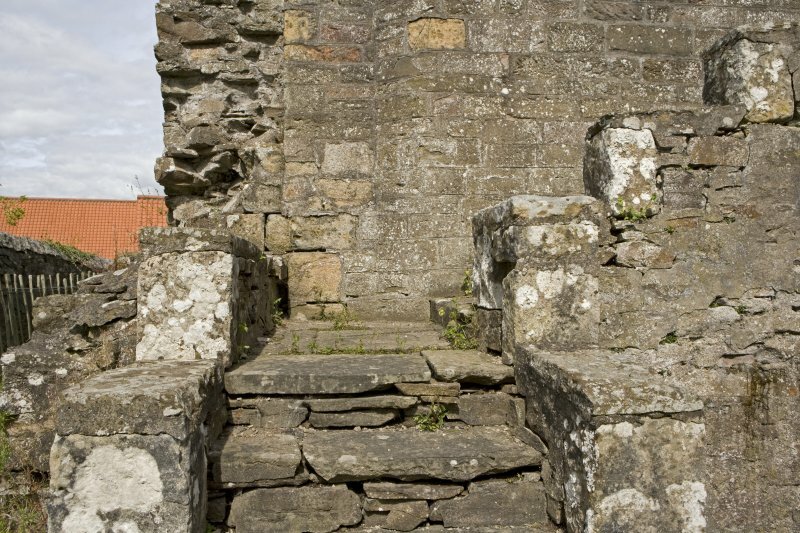 The first five steps of the night stair may be seen on the S of the wall, where they have been used as the starting point for the reconstructed stairs up to the first floor from the chapter house. 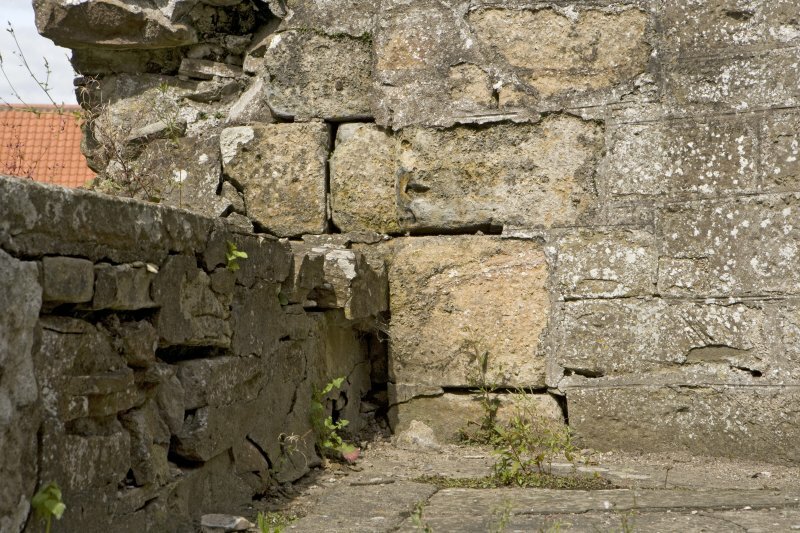 The bottom step is broader than the rest and marks a landing just inside the door, the stop for which is visible in the face of the wall on the slype side the stair. The modern stair turns at right angles to descend to the floor of the chapter house from this landing. 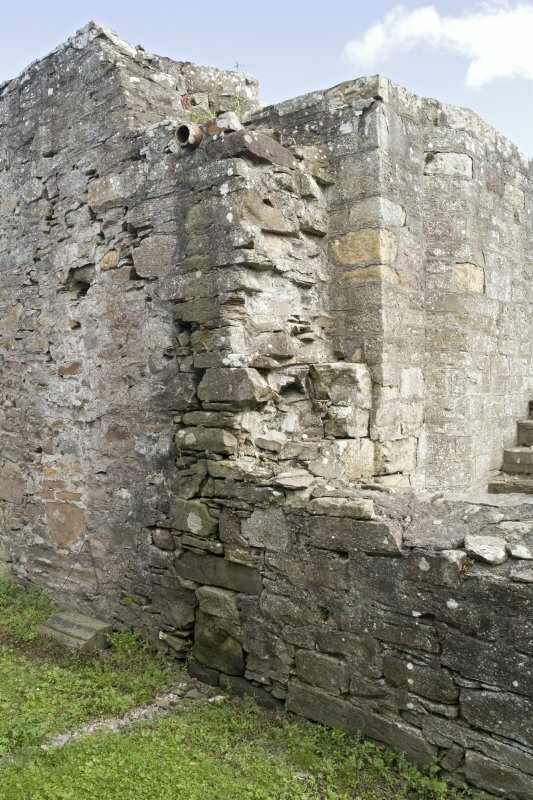 Originally the stair must have been built into the thickness of the wall. Beyond this point there is little of the structure that can be considered original. 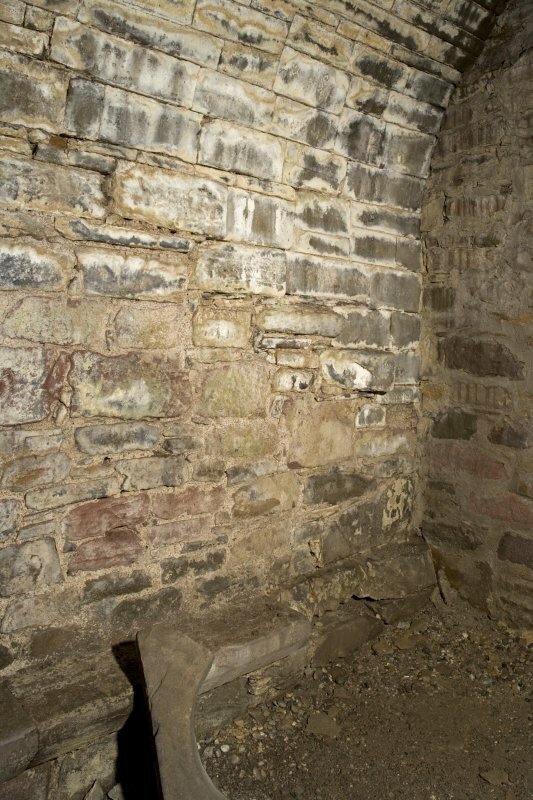 The walls are thinner than the standard for the monastic structure and are faced with rough coursed rubble (see below for a description of the cellars), which has been covered with a cement wash in modern times. 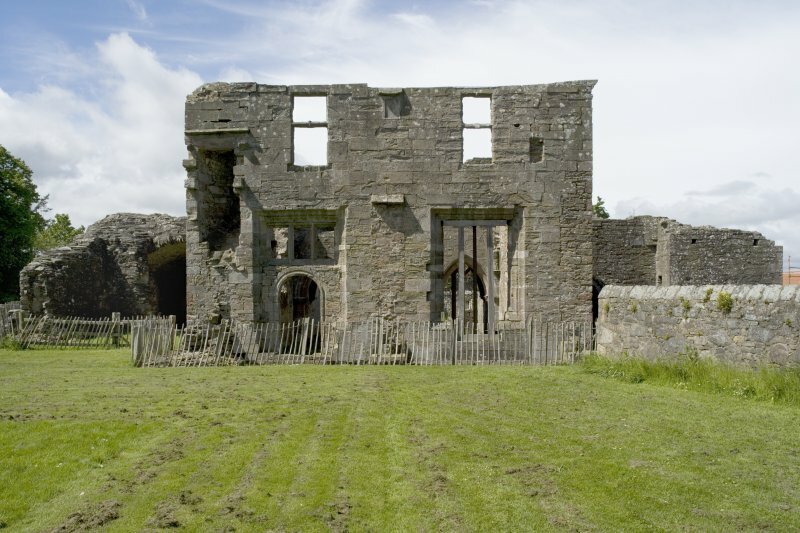 With the destruction of the Abbey in the War of the Rough Wooing in the 1540s and by reformers in 1559, the house may have ceased to have any function as an abbey, although some monks remained in residence. It passed into the hands of a commendator, John Hay, in 1560 and latterly to Henry Kinneir in 1574. 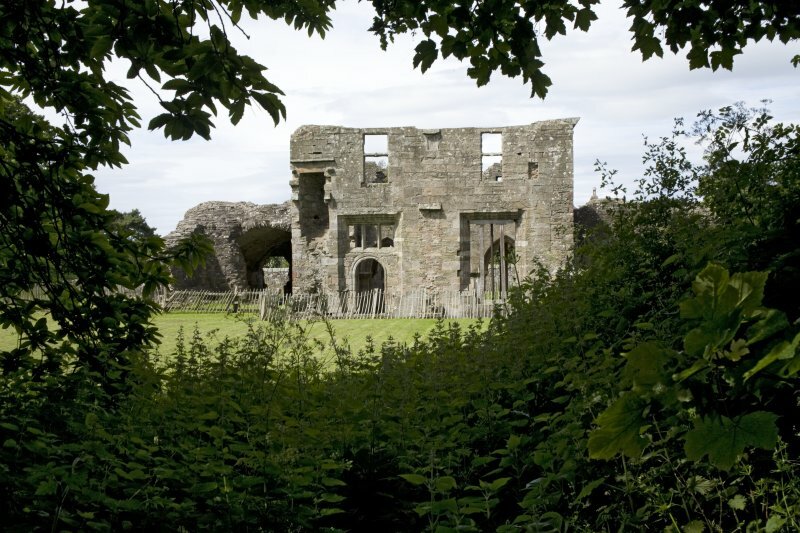 With the erection of the barony of Balmerino in respect of Sir James Elphinstone in 1603 the estates of the abbey formally became a lay estate. At some point in this period the ruins were converted into a house. The church seems to have been demolished apart from the N wall, perhaps to be reused as a yard or garden wall, and the N and W ranges, although Campbell reports that a large building used as a stable stood where the modern farmhouse now stands until the 19th century (Campbell 1899, 298). The E range, however, became a core part of the new house. This was conceived it seems as a central block with two wings. 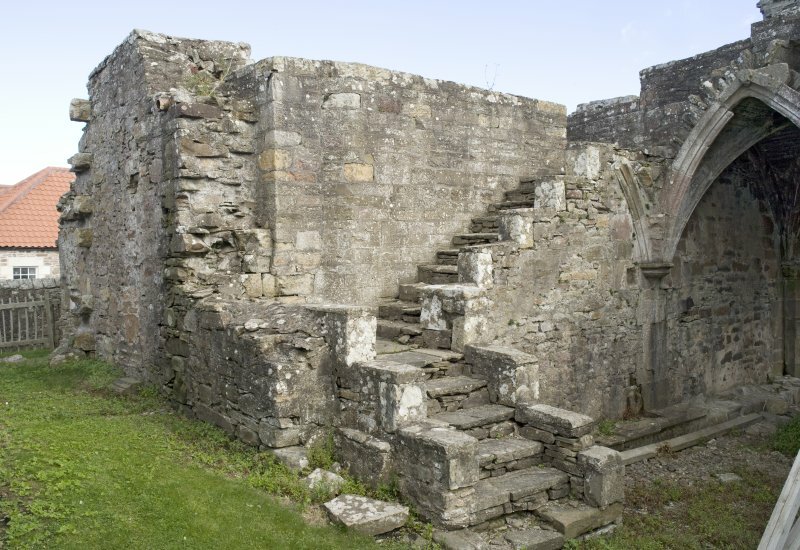 The ground floor or basement became the kitchens and stores for the house with a stair added onto the SE corner of the chapter house, providing access via a newel stair to a hall at first floor level. 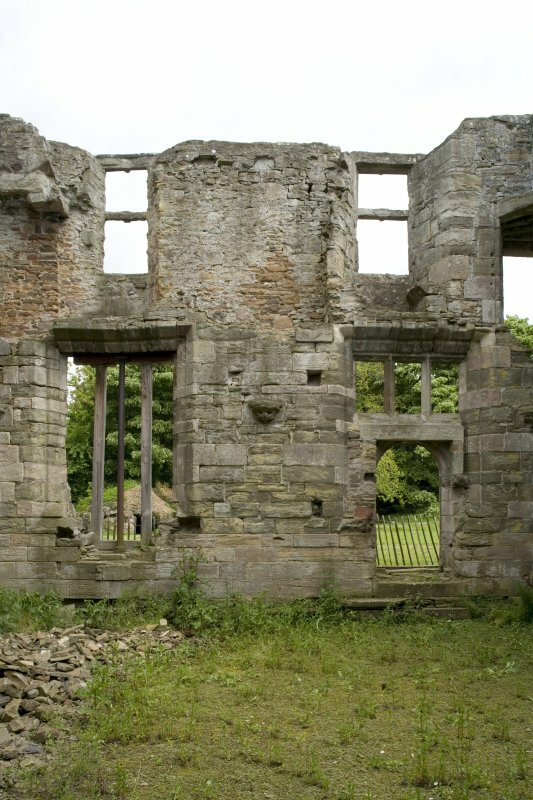 This hall was heated by a great fire in the middle of the E wall between two mullioned and transomed window openings of which that to the S had a window seat. 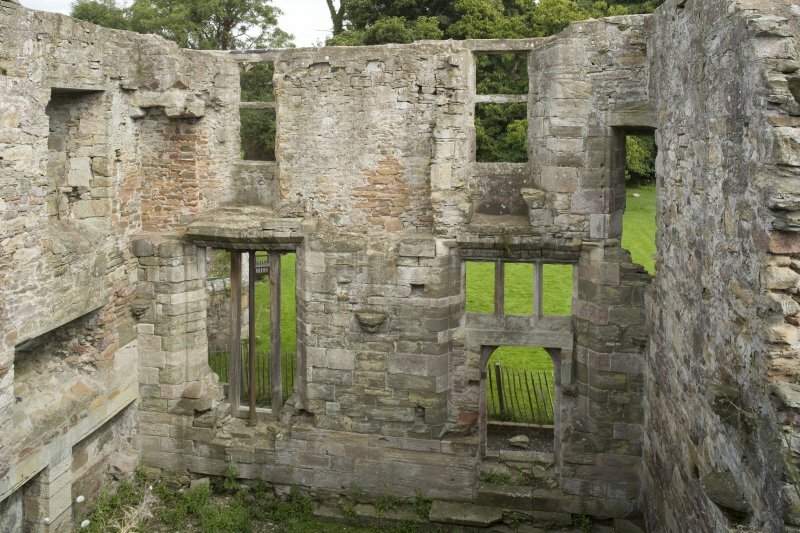 There appears to have been a press in the NE corner beside the N window in the E wall and two glazed windows were also opened in the N wall, but apparently none in the S wall, although the broken stonework towards the W end of the hall may be due to an opening for a window. 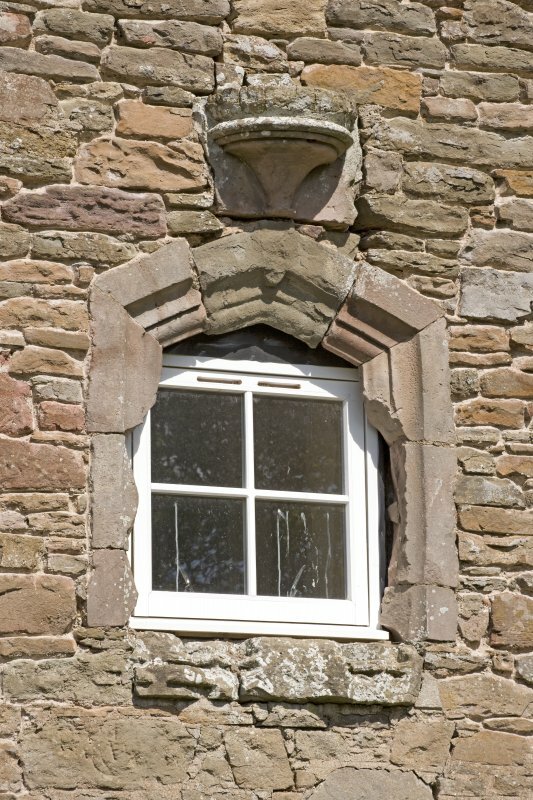 The S light in the E wall of the chapter house at ground level was modified with the insertion of a round arched entrance with a filleted roll moulding below a mullioned window of three lights. It is not clear if there was direct access from the hall to the rest of the first floor, although there is an opening on the S of the chimney stack from the kitchen fire that might be where access was gained. However, an engaving of 1797 by Grose show a blocked squared opening in this location beside a blocked round-headed one (Campbell 1899, 285). Cardonnel’s view of 1788 shows that there was an attic floor lit by small windows in the two gables of the roof. The upper floor of the E range appears to have been used as domestic space. 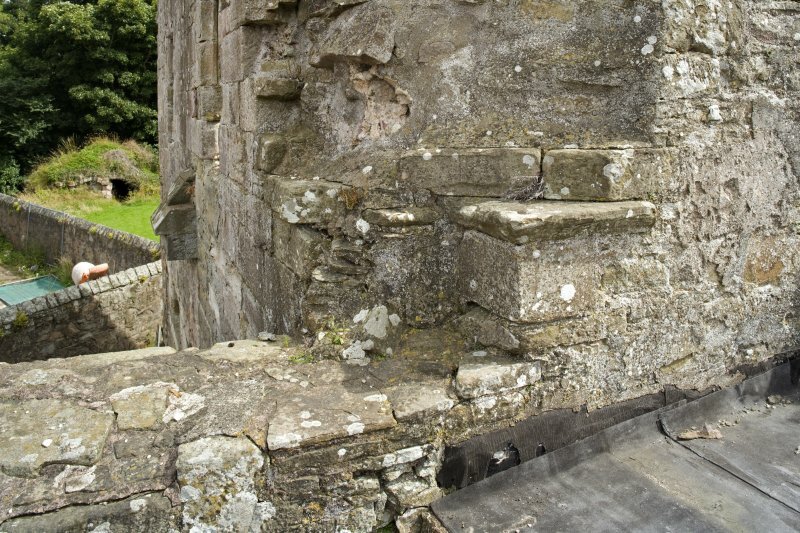 Here, two window openings have been detected, one in the E wall at the join with the N wall of the chapter house and the other in the N wall of the building, and there is a garderobe in the NE corner which is accessed via an opening with a chamfered stop from the main chamber. 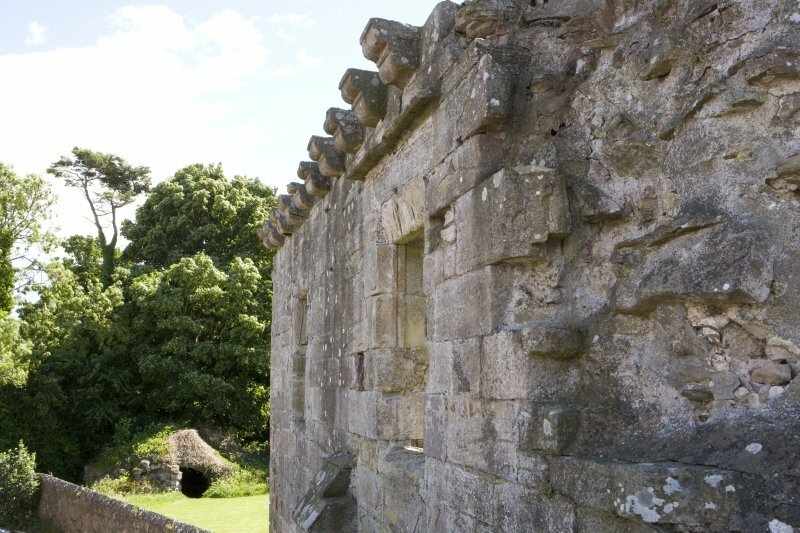 The window in the N wall must be coeval with the 16th century house since this wall is a shortening of the original east range, but the other may be an original dormitory window that has been respected in the extension of the chapter house. 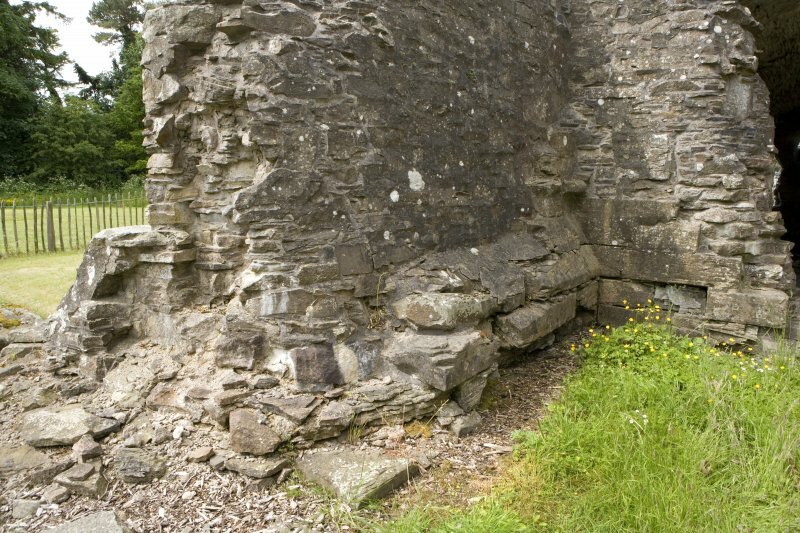 The presence of a row of corbels on the N wall indicate that there was a wall walk along this side, but this may be a pre-Reformation feature since there is no sign that the building has been raised. 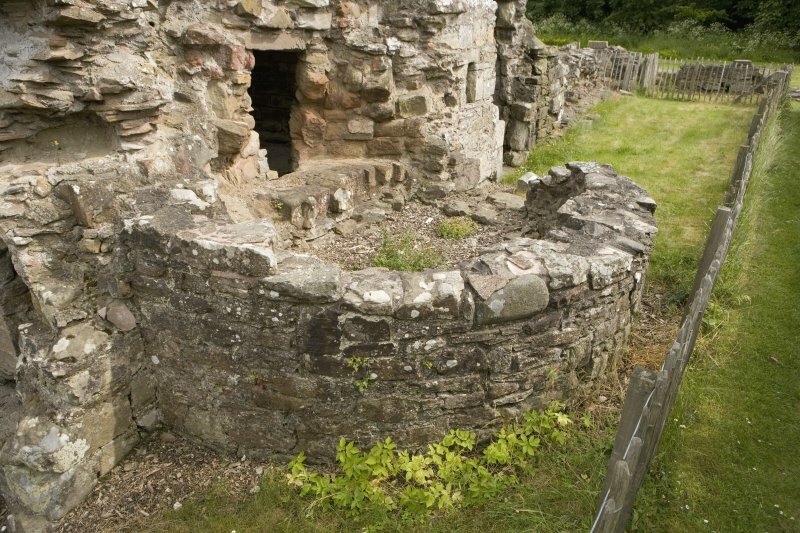 The kitchens comprised three separate rooms. The bakery with its oven and dough mixing trough in the former sacrity, the actual kitchen with the great fireplace that was cut through the stone vault of the vestibule and, a partition wall having been inserted between the pillars of the arcade, a basement room in the main part of the chapter house heated by a fireplace in the northerly bay of the same wall. 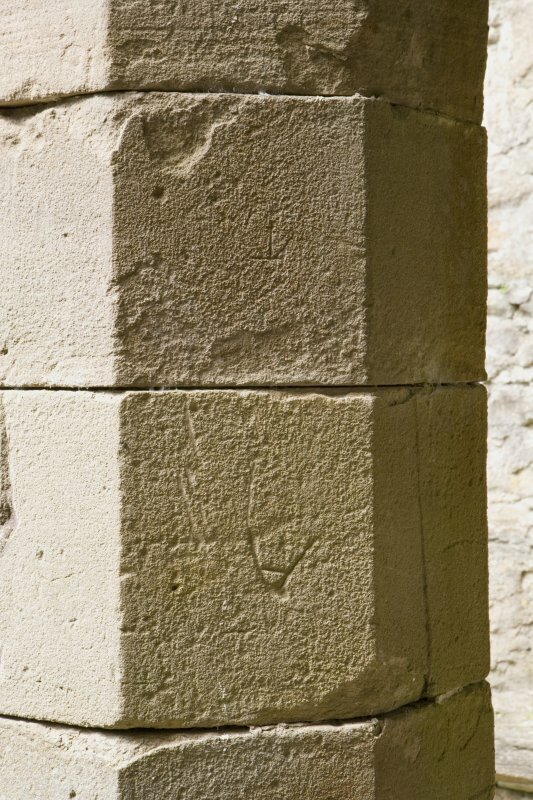 The three broad presses cut in the base of the N wall are an indication of its use as a store. In addition to these rooms a cellar was created that was accessed via steps down from the cloisters to the N of the kitchens. What the slype was used for in this new house can only be guessed since the W door was blocked and it was reduced to being a store as it remains to this day. The other two cellars are accessed via traps at the first floor; the one on the E is lit by a slit window and is very deep at 4.65m. That to the W is entered by steps down from the W and may have been a wine cellar. A small cavity above it could not accessed. The garderobe block is served by a drain that runs off to the dene to the NE via a stone lined culvert capped with large flat roughly dressed slabs, excavated by John Lewis and Sam Scott (2010). This block has been washed with dark grey cement and its stonework is unclear and no open chute is now evident. 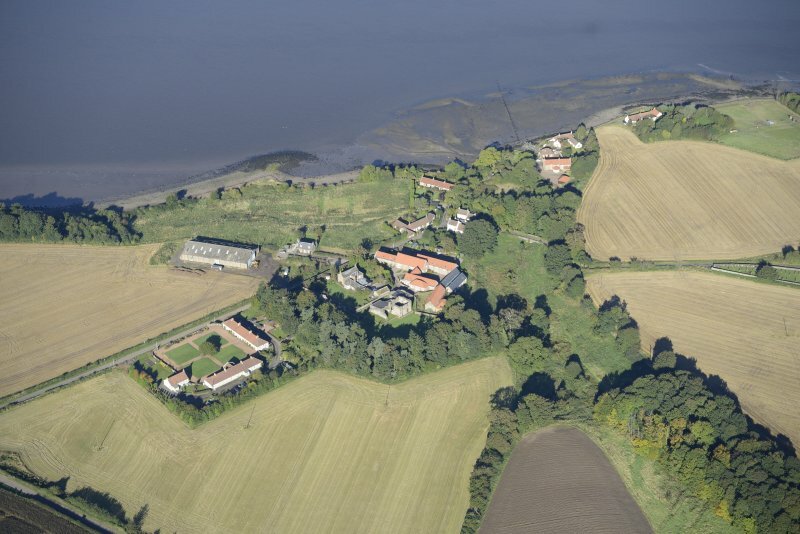 The Cistercian abbey of Balmerino is situated on a terrace overlooking the Tay estuary. Founded in 1226/7 by Alexander II and Queen Ermengarde, it was burned by the English in 1547 and raided by reformers in 1559. After the Reformation the abbey was granted to a series of commendators, who may be responsible for some of the changes which may be seen in the buildings. 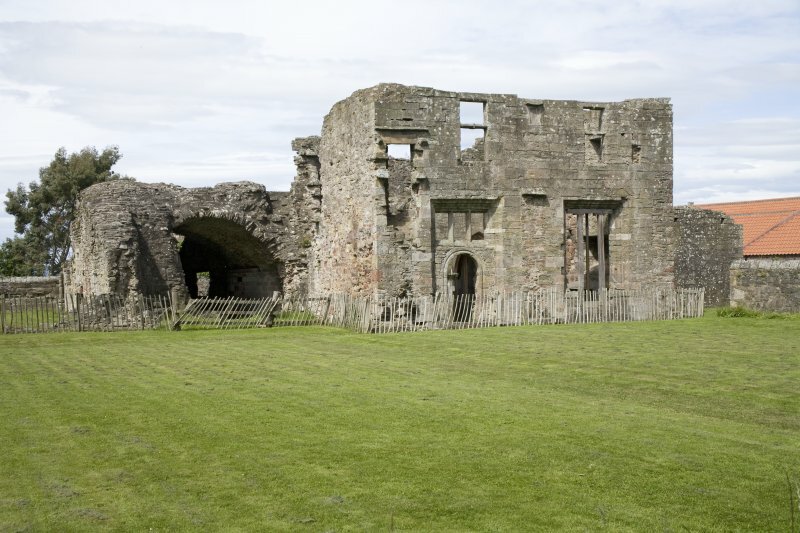 It was subsequently erected into a lordship for the Elphinstone lords of Balmerino. 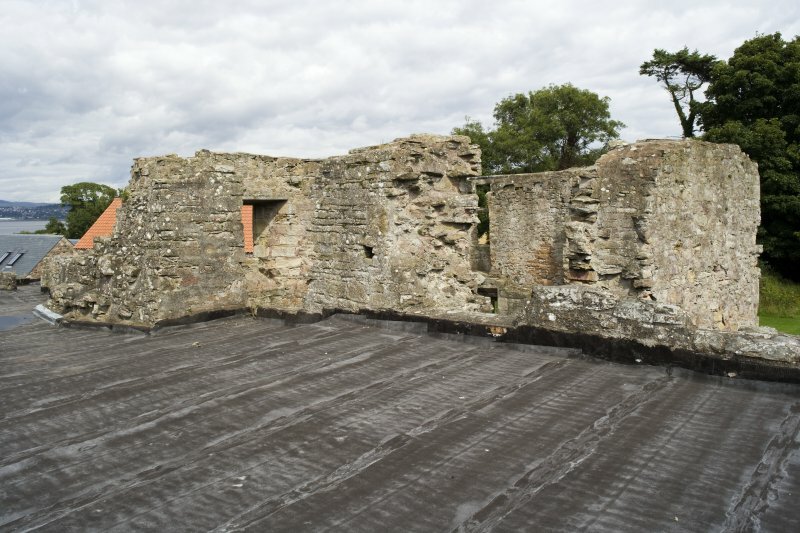 However, most of the demolition of the surviving buildings appears to have carried out in the early seventeenth century by the second Lord Balmerino for use in the repair of the church at Monifieth. 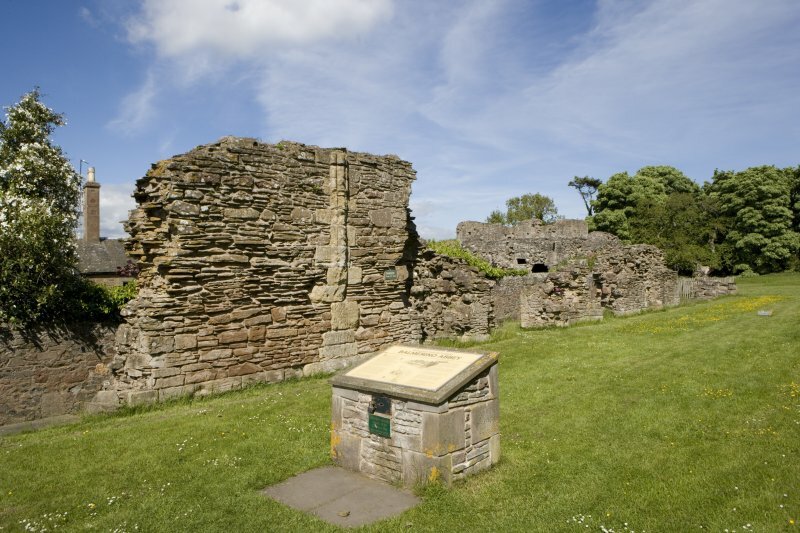 The surviving features comprised fragments of the abbey church (NO32SE 2.06), the east range, the freestanding building to the east known as the Abbot’s House (NO32SE 2.01) and the large two storey building known as the Abbey Barn to the north (NO32SE 2.02), which was incorporated in the Improvement Period farmsteading (NO32SE 2.04). Nothing of the precinct wall now remains. Campbell (1899, 301) speculates about its course across the field to the south of the abbey church, which is now partly occupied by the almshouses. In this area, he observed a ridge from east to west across the field and identified it as the line of the wall. Although the plough had disturbed some stone work in this area on the date of survey, there was no visible topography to support it. Geophysical survey would be the best method of investigating this possibility. 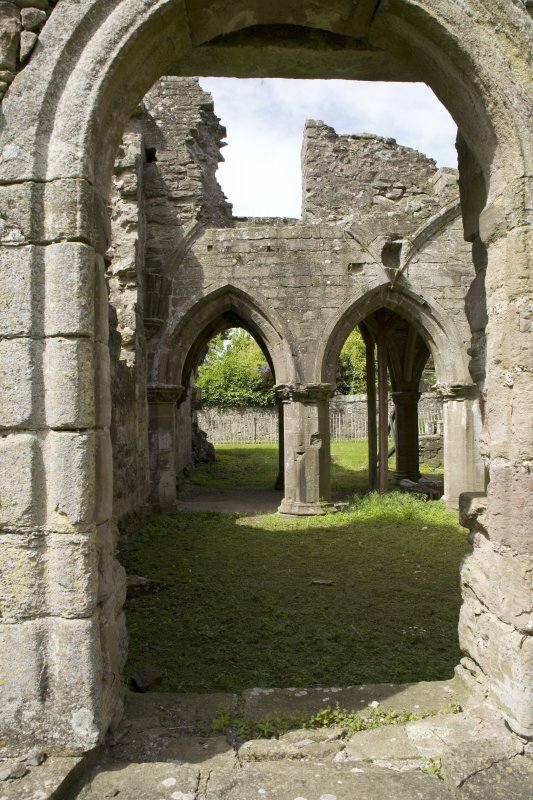 The abbey is laid out according to a standard Cistercian design, but with the cloister to the north, as at Melrose. 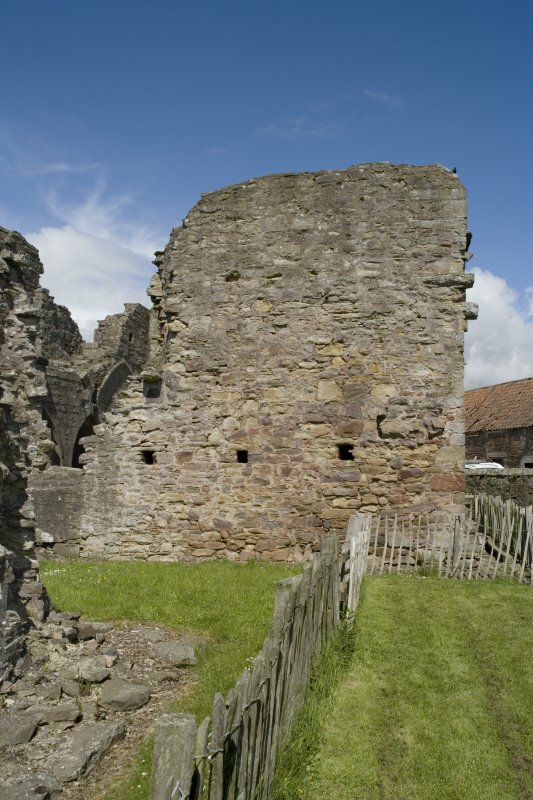 Nothing of the north and west range survive except for the raggles of the return of the cloister walls on the church and east range walls. Indeed, it is by no means certain that a west range ever existed since there is no raggle for a parallel wall to make the other side of the range, although there is space for it; because the facings of the wall have been robbed at this point, a range may be inferred. 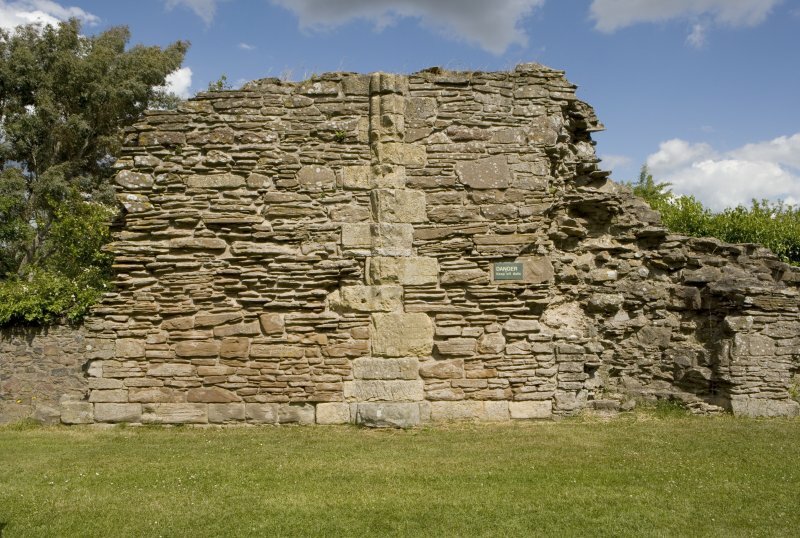 However, the basal chamfer of the cloister wall along the north side of the church runs under the raggle which suggests that the original design of the west range had been changed. 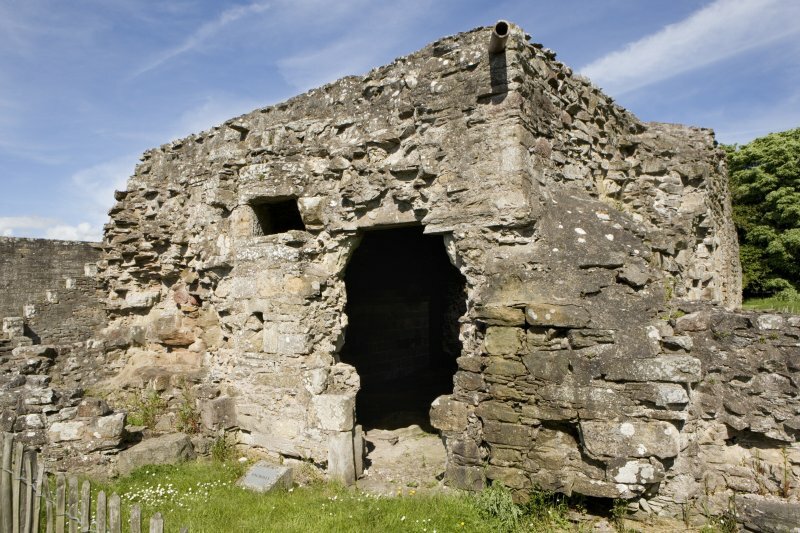 Campbell refers to a large building used as stables in the area of the farmhouse, which may have been the west range designed to provide accommodation for the conversi (Campbell 1899, 298). The east range does not now extend far enough to show any trace of the other wall of the north range. It still stands to first floor level, and to the roofline on two sides of the chapter house. This building with its large mullioned windows and late Gothic vaulting is the most interesting architectural survival on the site. Its north end has been demolished and altered in its conversion to a house for the commendator. 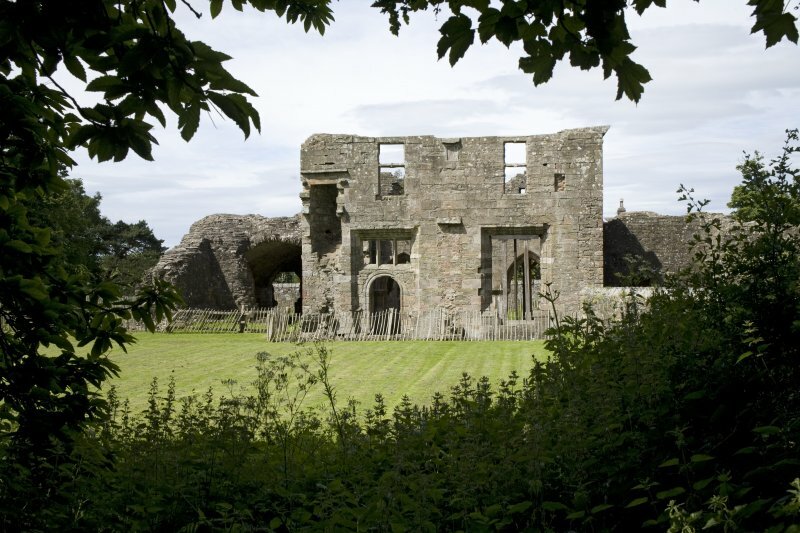 The east range includes, from south to north: the sacristry, the chapter house, the stairs to the dormitory, a passage or slype and some cellars, the latter probably belonging to the commendator’s house. The foundations of two parallel walls, revealed in the Scotia excavations to the north of the east range and which were aligned with it, have been interpreted as the east range extending 7–8 m further to the north. The refectory may be presumed to lie in the north range. 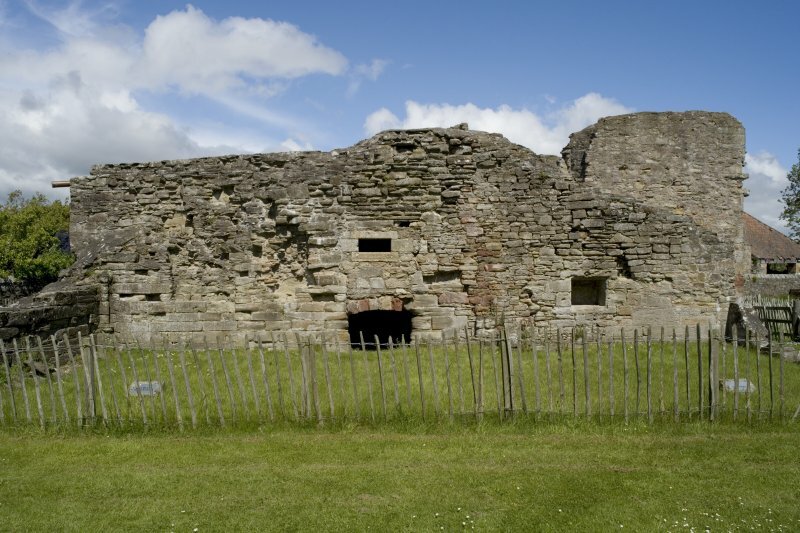 The so-called Abbot’s House (NO32SE 2.01) situated 35 m to the east is a two bay structure with a vaulted basement. Aligned on the same orientation as the rest of the monastery, it measured about 9.5 m by 7.5 m overall, on the assumption that the two basement chambers are of equal size, but it cannot have been much longer due to the cut of the river terrace immediately to the north. 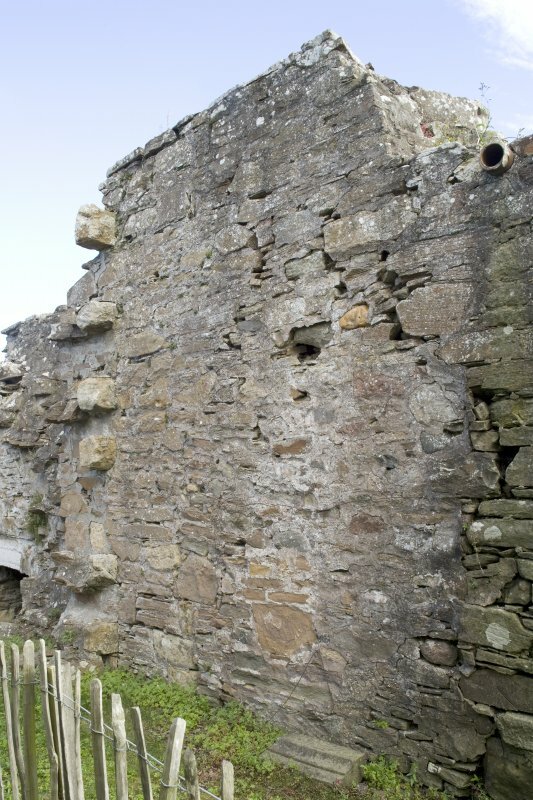 Its walls are 1 m thick and are partly faced with thin rubble slabs with some squared ashlar work, suggesting that it had been relieved of its dressed stone. The quoins of the openings are well-constructed in grey sandstone ashlar, as is the vault. 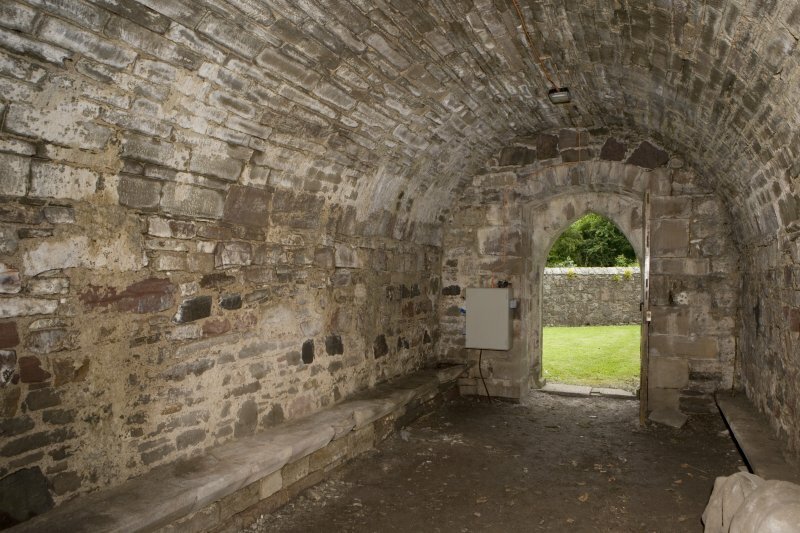 There is a chamfered round arched entrance between the two chambers and window lights to east and west in the surviving chamber, with chamfered arrises. A secondary entrance has been cut in the west wall to the south of the window opening, which has been blocked and a press arranged in the blocking. 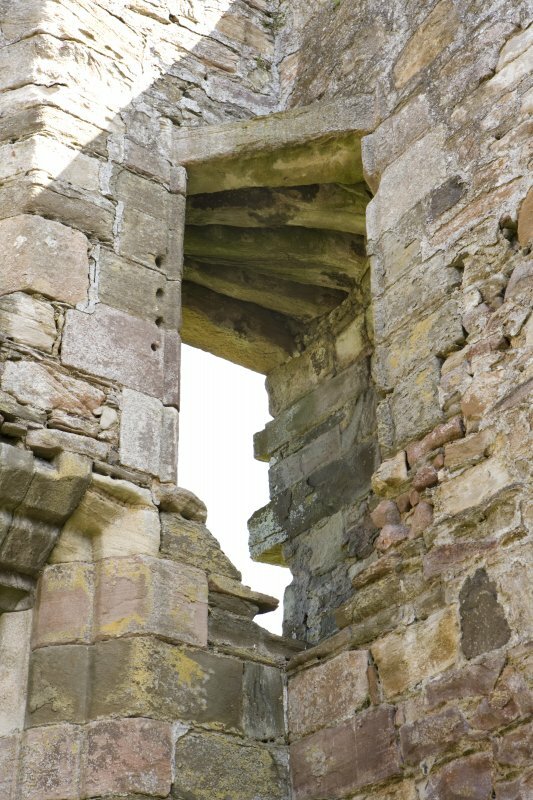 The base of the window in the east wall has been partially blocked. 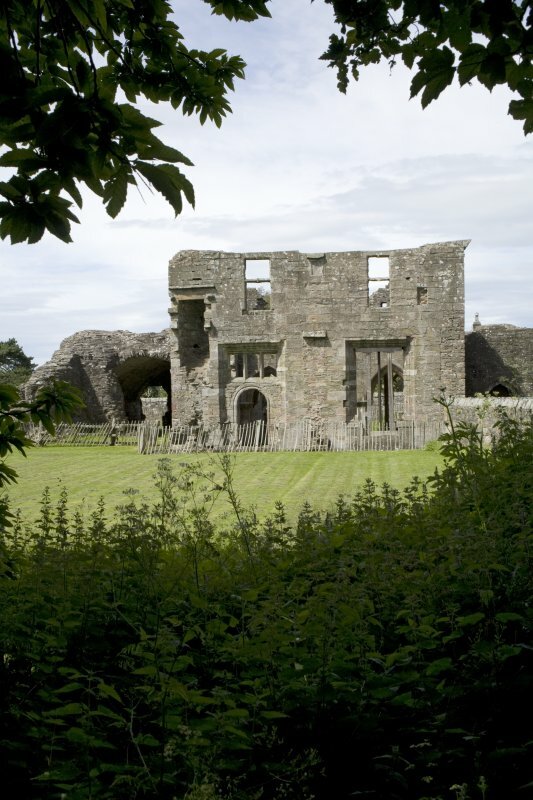 As it stands, it would be small for an infirmary, the suggested alternative to an Abbot’s House. The shallow arched openings of the windows and the round-arched door between the two basements suggest a late medieval date. Campbell notes that it was once called the Commendator’s House and that this became the residence of Lord Balmerino (Campbell 1899, 299). He notes that it was once approached by a stair on its west, now gone, and had another on the east leading to a garden and a kitchen entrance, which may be the opening in the west of the basement. To the north of the cloisters one abbey building still stands, the so-called Abbey Barn (NO32SE 2.02). 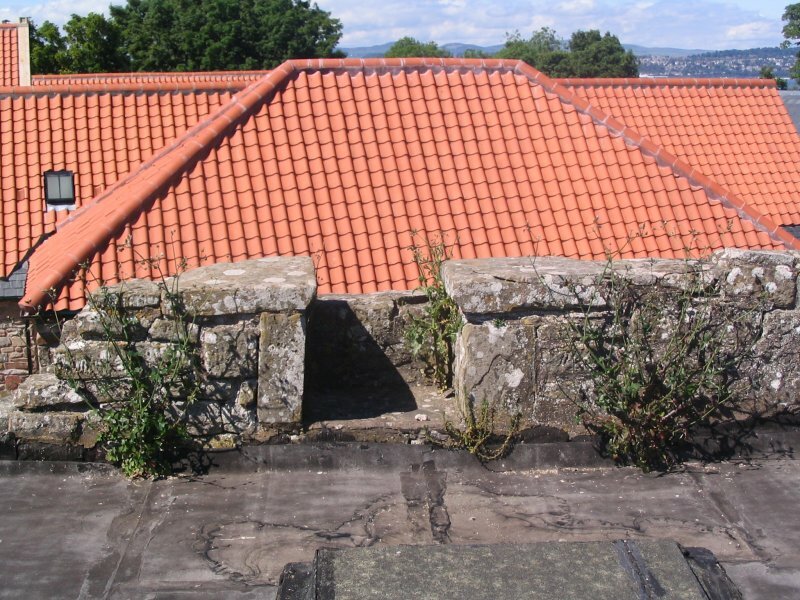 This building measures 20 m WSW and ENE by 7.2 m in breadth over brown sandstone rubble walls, 0.9 m in thickness, increasing to 1.2 m at the gable. The building is a parallelogram aligned with the cloisters at the gable but orientated obliquely to the cloisters along its length, probably to avoid existing structures at its east end. It stands two storeys in height and has a steeply pitched roof. There is a scarcement along the inside of the walls above the ground floor windows to support the first floor joists. Any original window lights in the first floor might be expected to have dormers, since no obvious sign remains in the stonework. 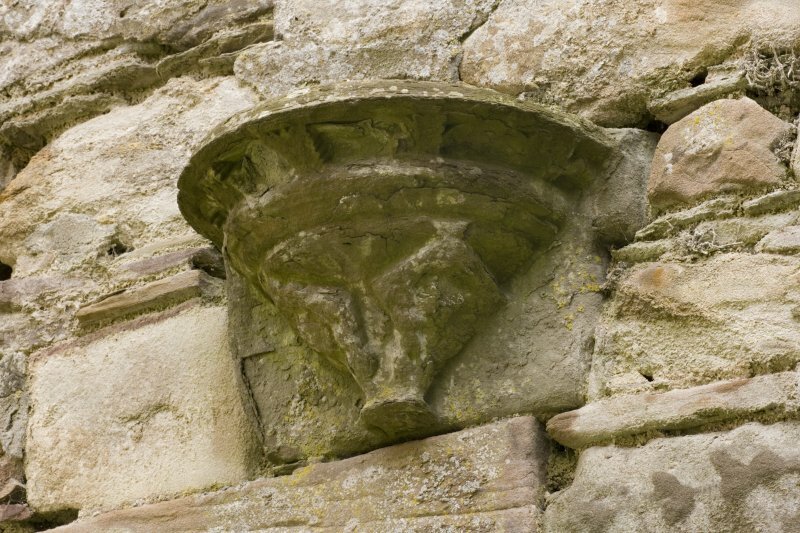 The skewput on the north-west corner of the building is decorated with a shield bearing an unidentified armorial device. 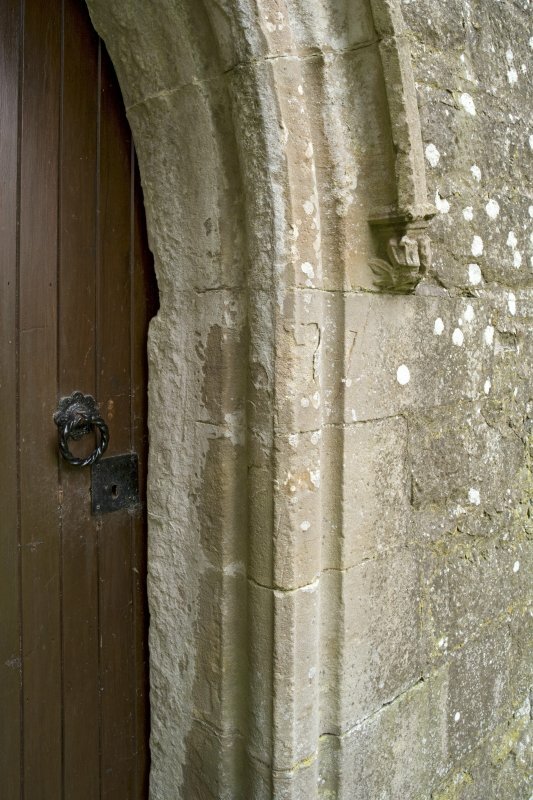 There is an entrance with a deeply chamfered gothic arch of late thirteenth century date 6 m from the west gable and another wider opening with similar chamfered quoins some 5 m further east. This is a double width entrance suitable for a barn, but its lintel is modern timber, and a two centred arch would leave a trace in the stonework above the entrance. The original opening could have been widened after the Reformation. The domestic scale of the entrance to the west is inappropriate in a barn and there would be less need for a first floor in a barn, although a loft would be a possibility. 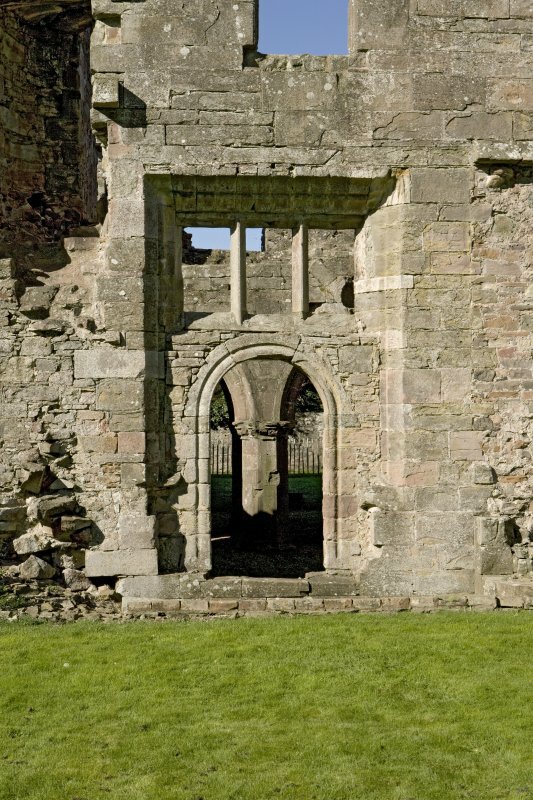 In between the two entrances there is a slit window with a square head, again of a domestic character. The excavations by Scotia revealed an extensive area of cobbles to the west of the building, with a distinct camber suggesting a roadway. 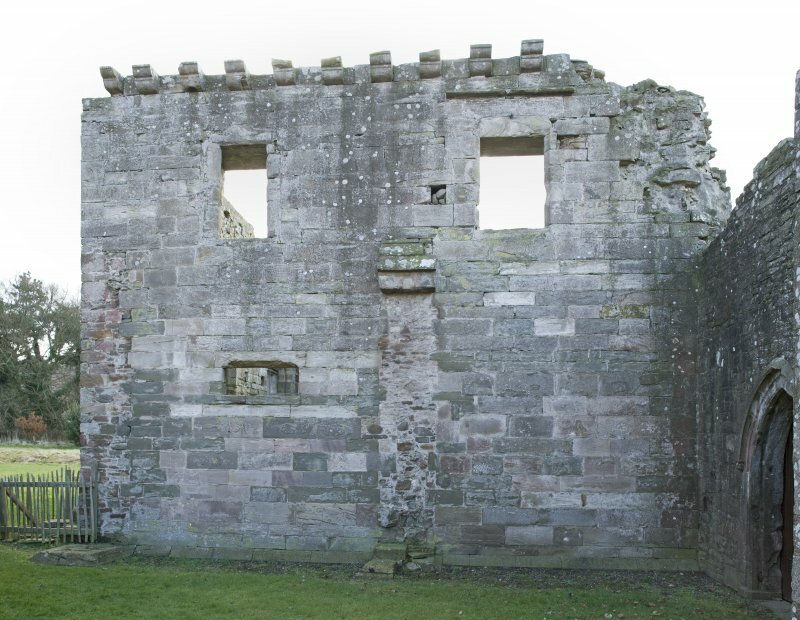 The foundation of a thick wall ran up to the south end of the west gable on the same alignment, which may be the remains of a precinct wall enclosing the outer court of the monastery. Scotia also excavated a kiln, probably of seventeenth century date, in the east end of the barn. 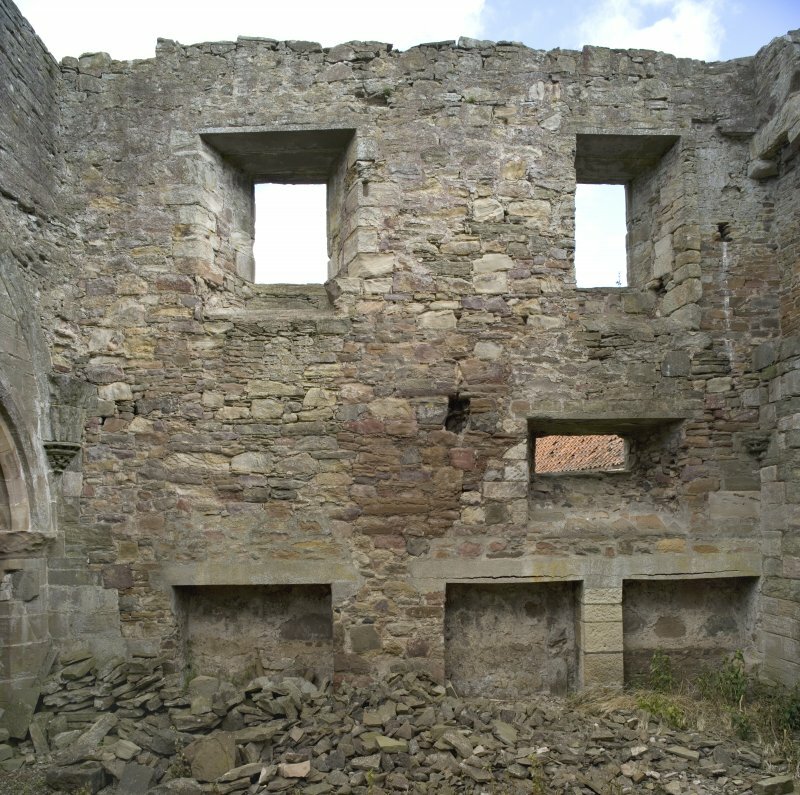 A programme of survey and recording was initiated by RCAHMS in 2006 and completed in 2009. 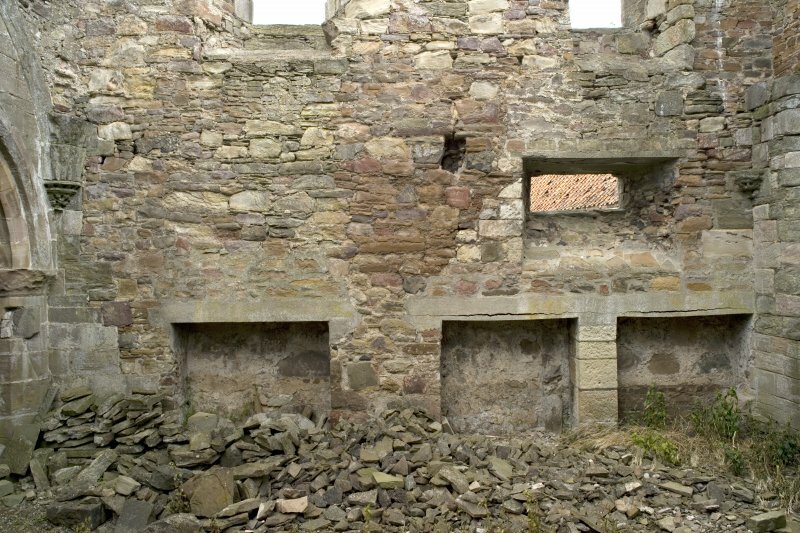 This was a response, in part, to a request from Scotia Archaeology Ltd, who had been engaged by RonCal Developments to record the archaeology revealed in the course of the conversion to housing of the farmsteading, which lay to the north of the ruins of the Cistercian Abbey of Balmerino, and, in part, to a request from the Balmerino History Group to carry out a topographical survey of the abbey remains and its surrounding landscape in the hope of defining the abbey precinct. 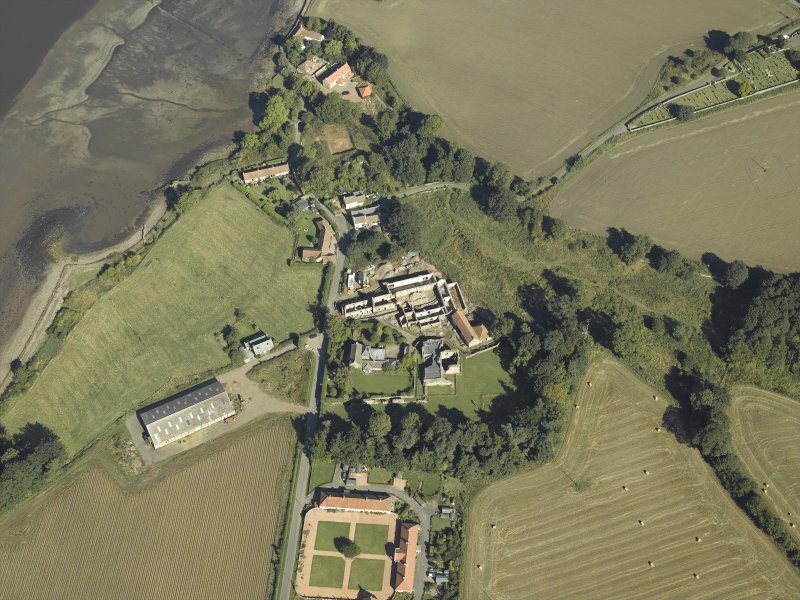 The immediate task was to place the farmsteading in the context of the wider abbey buildings on a plan at a scale sufficiently large to include the details of openings and the different phases of construction. 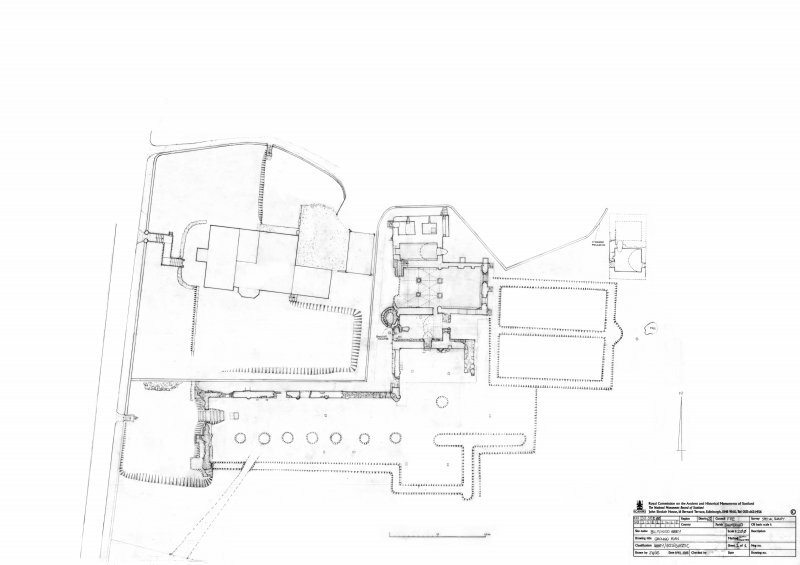 A plan at a scale of 1:200 was drawn up which included the two parts of the site, based upon a Total Station survey. 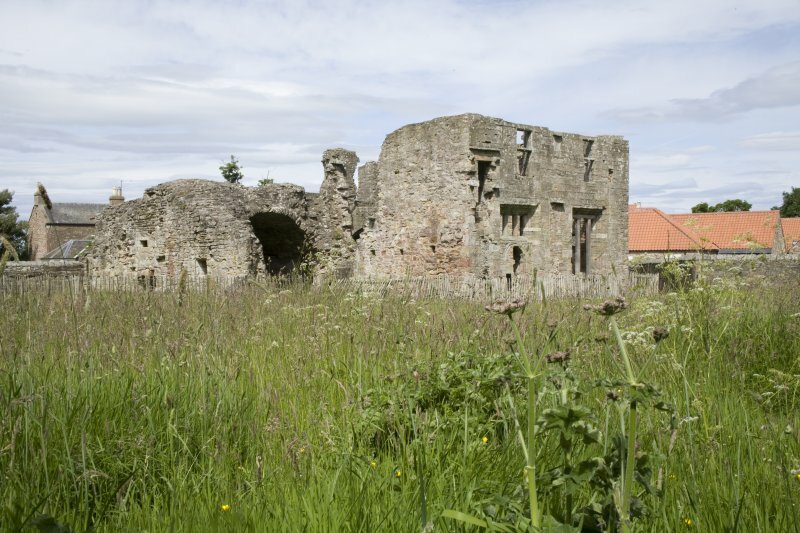 Using this plan as a base, an interpretation of the main phases of activity was produced which identified: the original structure, the conversion of the east range of the abbey to a commendator’s house, the Improvement Period farmsteading and modern repairs to the ruins. 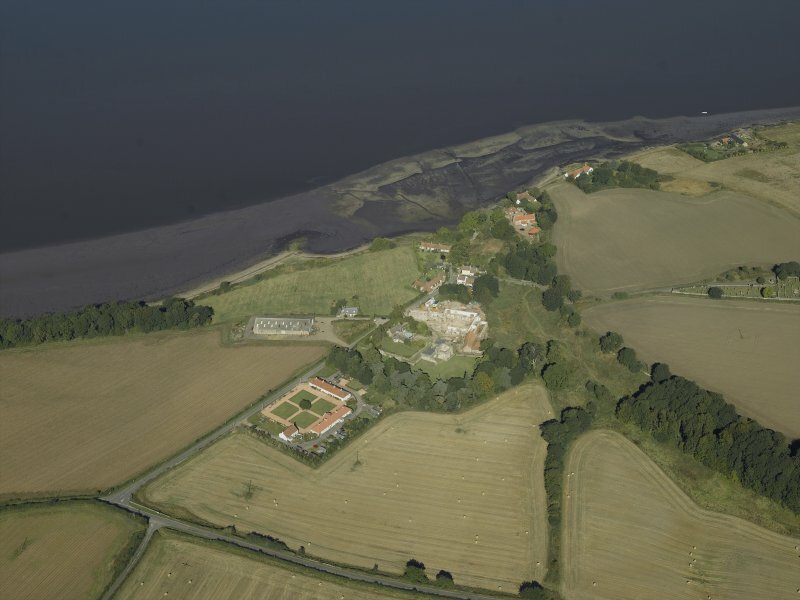 A full photographic survey of the conventual buildings was also carried out and there was a Total Station survey of the remains of the mill site in the river gully to the north-east, at the site of the so-called Monk’s Well and the eighteenth century mill dam and lade leading to the Abbey mill by the sea shore. 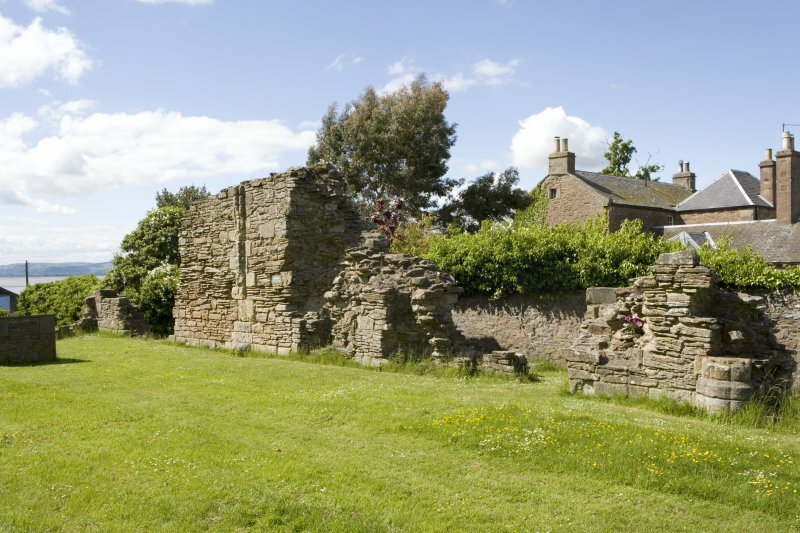 The surviving features comprised fragments of the abbey church, the east range, the freestanding building to the east known as the Abbot’s House and the large two storey building known as the Abbey Barn to the north, which was incorporated in the Improvement Period farmsteading. Nothing of the precinct wall now remains. Campbell speculates about its course across the field to the south of the abbey church, which is now partly occupied by the almshouses. In this area, he observed a ridge from east to west across the field and identified it as the line of the wall. Although the plough had disturbed some stone work in this area on the date of survey, there was no visible topography to support it. Geophysical survey would be the best method of investigating this possibility. 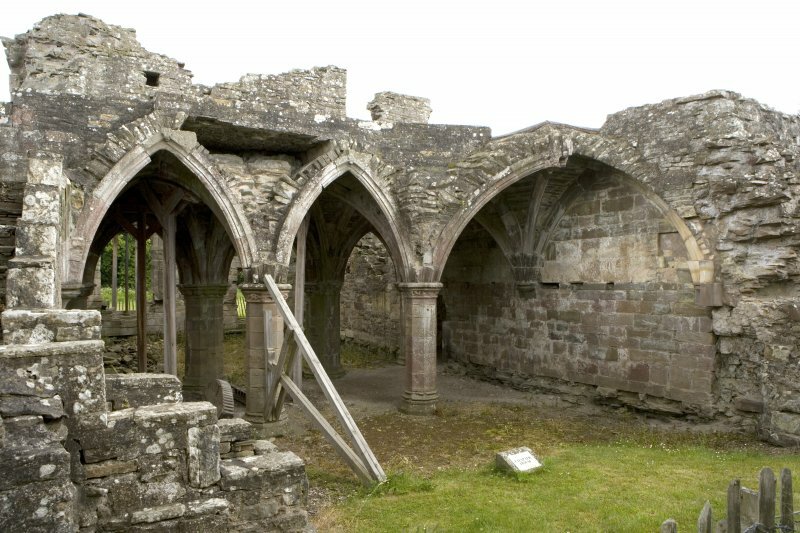 The abbey is laid out according to a standard conventual design, but with the cloister to the north, as at Melrose. 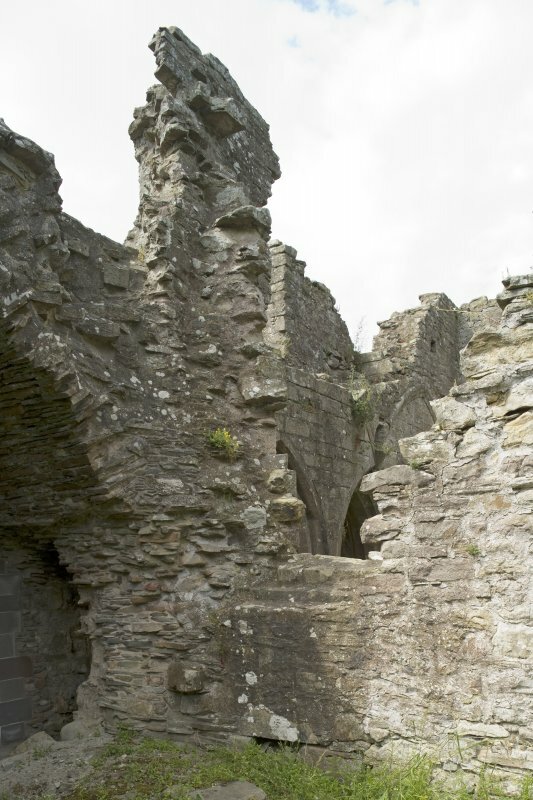 Nothing of the north and west range survive except for the raggles of the return of the cloister walls on the church and east range walls. Indeed, it is by no means certain that a west range ever existed since there is no raggle for a parallel wall to make the other side of the range, although there is space for it; because the facings of the wall have been robbed at this point, a range may be inferred. 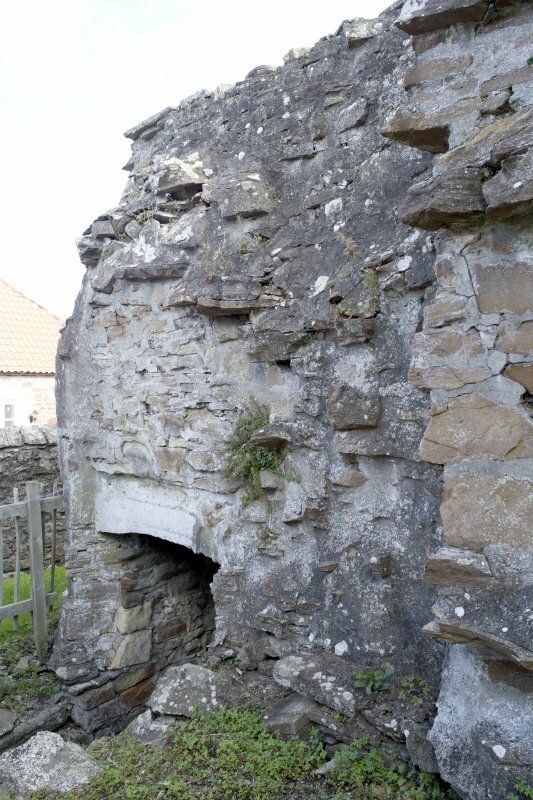 However, the basal chamfer of the cloister wall along the north side of the church runs under the raggle which suggests that the original design of the west range had been changed. 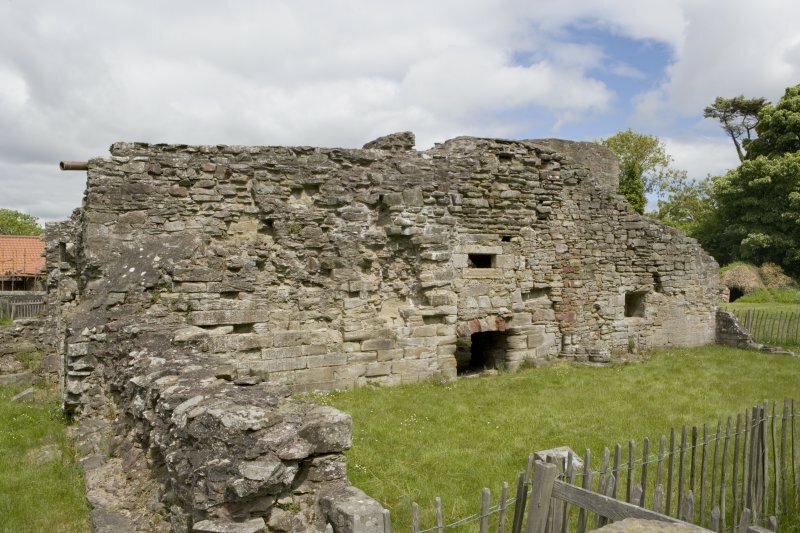 Campbell refers to a large building used as stables in the area of the farmhouse, which may have been the west range designed to provide accommodation for the conversi (Campbell 1899, 298). The east range does not now extend far enough to show any trace of the other wall of the north range. It still stands to first floor level, and to the roofline on two sides of the chapter house. This building with its large mullioned windows and late Gothic vaulting is the most interesting architectural survival on the site. Its north end has been demolished and altered in its conversion to a house for the commendator. 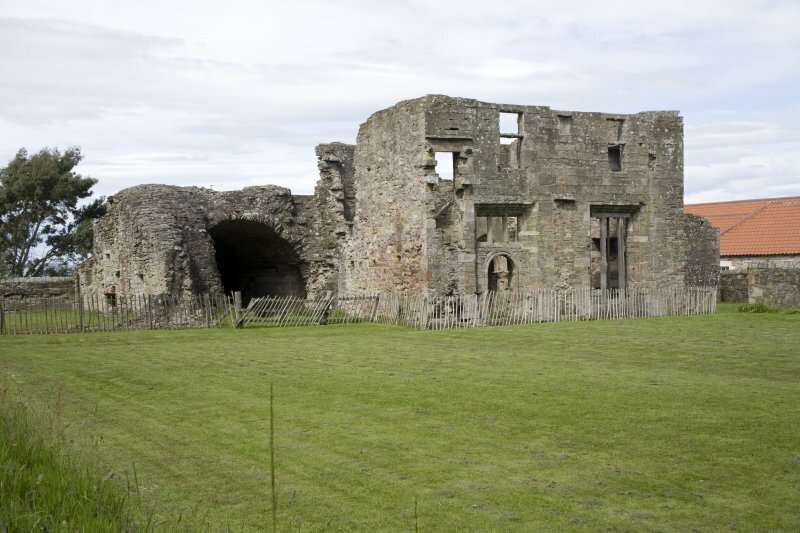 The east range includes, from south to north: the sacristry, the chapter house, the stairs to the dormitory, a passage or slype and some cellars, the latter probably belonging to the commendator’s house. The foundations of two parallel walls, revealed in the Scotia excavations to the north of the east range and which were aligned with it, have been interpreted as the east range extending 7-8m further to the north. 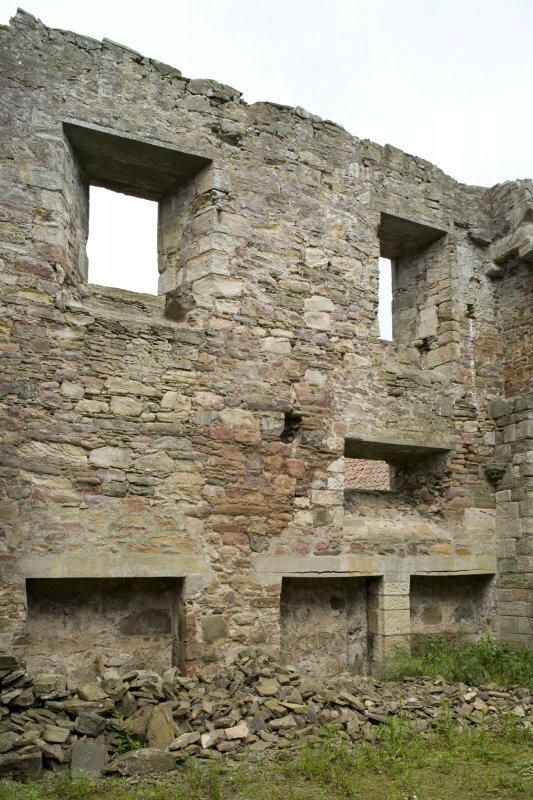 The refectory may be presumed to lie in the north range. The so-called Abbot’s House situated 35m to the east is a two bay structure with a vaulted basement. Aligned on the same orientation as the rest of the monastery, it measured about 9.5m by 7.5m overall, on the assumption that the two basement chambers are of equal size, but it cannot have been much longer due to the cut of the river terrace immediately to the north. 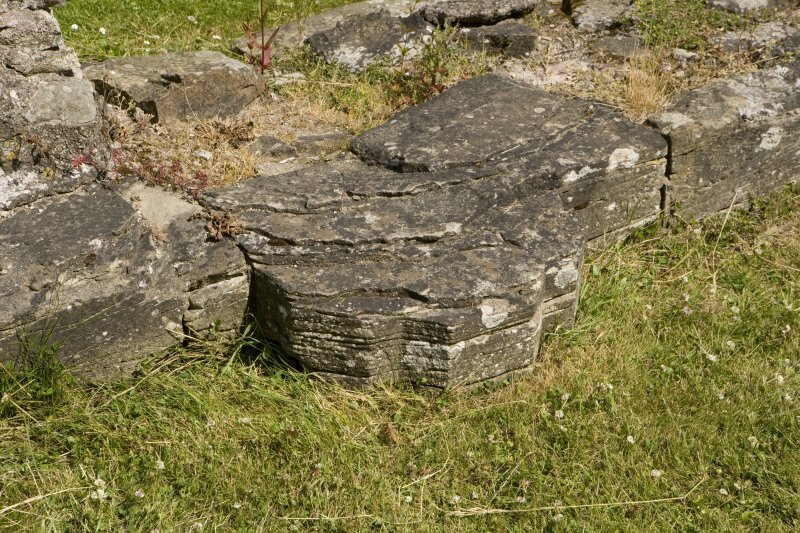 Its walls are 1m thick and are partly faced with thin rubble slabs with some squared ashlar work, suggesting that it had been relieved of its dressed stone. 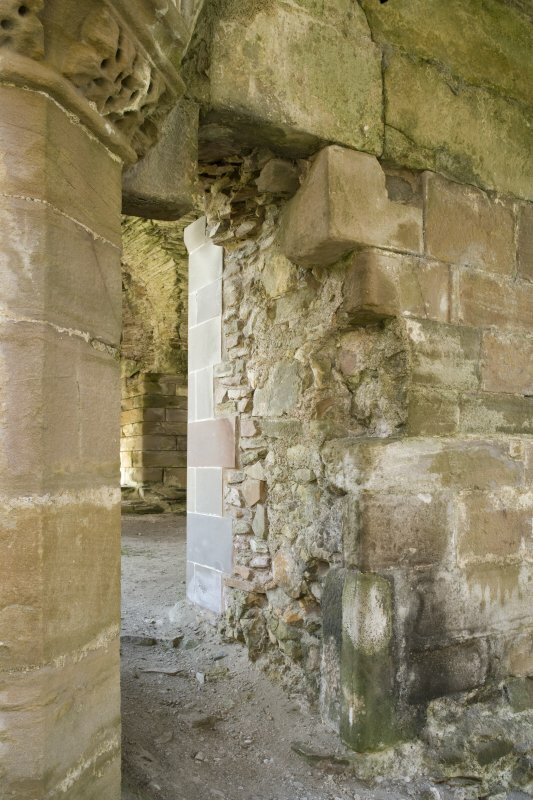 The quoins of the openings are well-constructed in grey sandstone ashlar, as is the vault. 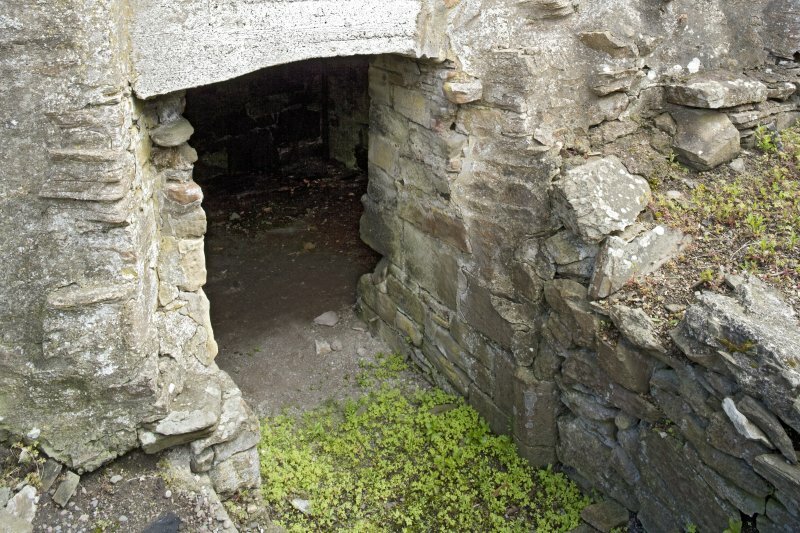 There is a chamfered round arched entrance between the two chambers and window lights to east and west in the surviving chamber, with chamfered arrises. 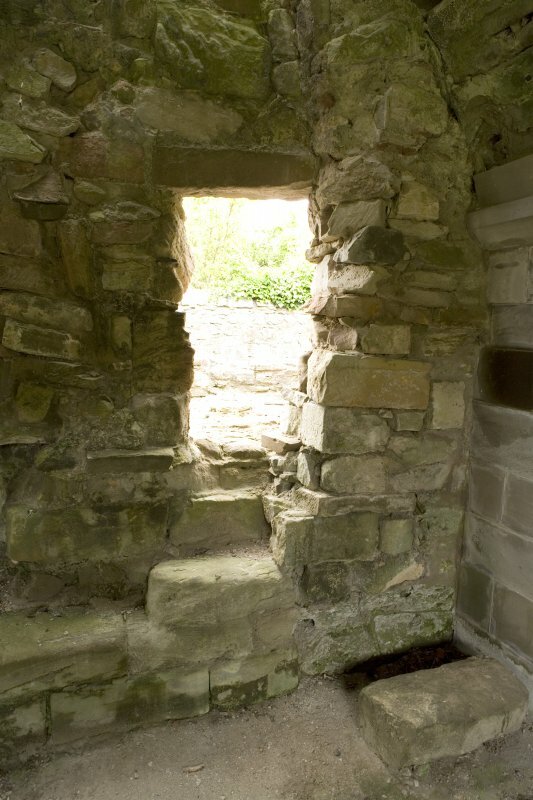 A secondary entrance has been cut in the west wall to the south of the window opening, which has been blocked and a press arranged in the blocking. The base of the window in the east wall has been partially blocked. As it stands, it would be small for an infirmary, the suggested alternative to an Abbot’s House. The shallow arched openings of the windows and the round-arched door between the two basements suggest a late medieval date. Campbell notes that it was once called the Commendator’s House and that this became the residence of Lord Balmerino (Campbell 1899, 299). He notes that it was once approached by a stair on its west, now gone, and had another on the east leading to a garden and a kitchen entrance, which may be the opening in the west of the basement. 1.2 m at the gable. The building is a parallelogram aligned with the Cloisters at the gable but orientated obliquely to the cloisters along its length, probably to avoid existing structures at its east end. It stands two storeys in height and has a steeply pitched roof. There is a scarcement along the inside of the walls above the ground floor windows to support the first floor joists. Any original window lights in the first floor might be expected to have dormers, since no obvious sign remains in the stonework. 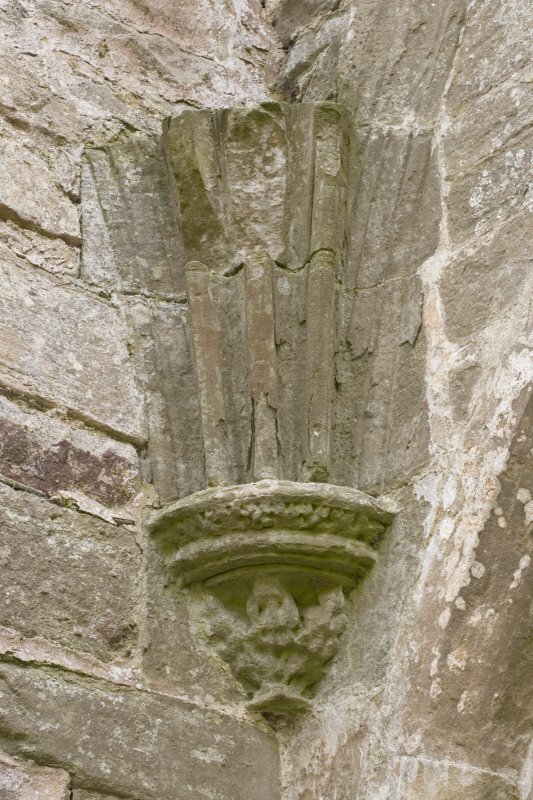 The skewput on the north-west corner of the building is decorated with a shield bearing an unidentified armorial device. 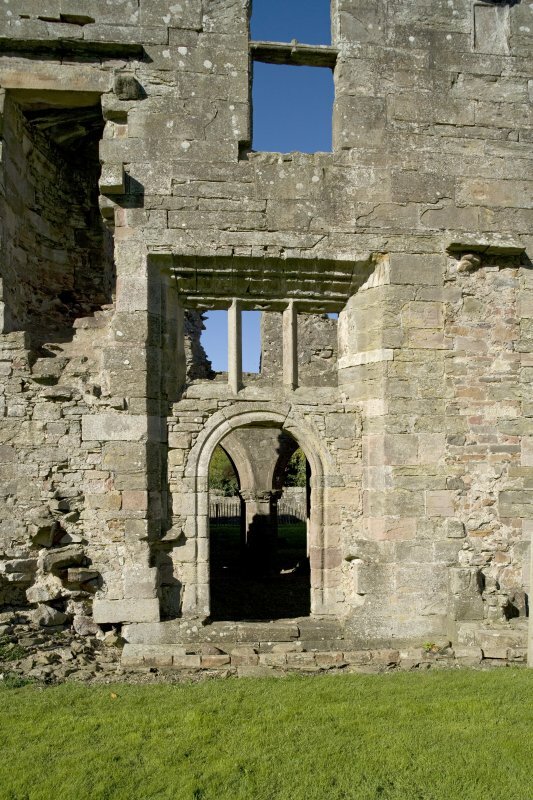 There is an entrance with a deeply chamfered gothic arch of late thirteenth century gate 6m from the west gable and another wider opening with similar chamfered quoins some 5m further east. This is a double width entrance suitable for a barn, but its lintel is modern timber, and a two centred arch would leave a trace in the stonework above the entrance. The original opening could have been widened after the Reformation. The domestic scale of the entrance to the west is inappropriate in a barn and there would be less need for a first floor in a barn, although a loft would be a possibility. 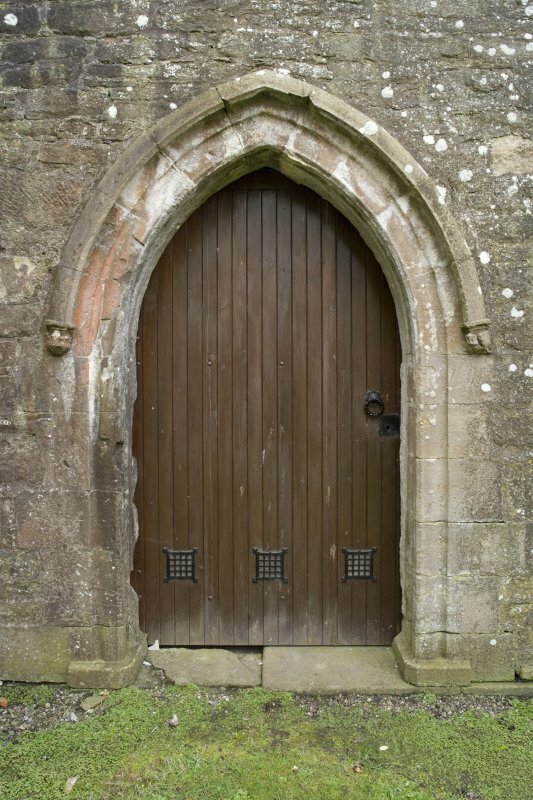 In between the two entrances there is a slit window with a square head, again of a domestic character. The excavations by Scotia revealed an extensive area of cobbles to the west of the building, with a distinct camber suggesting a roadway. 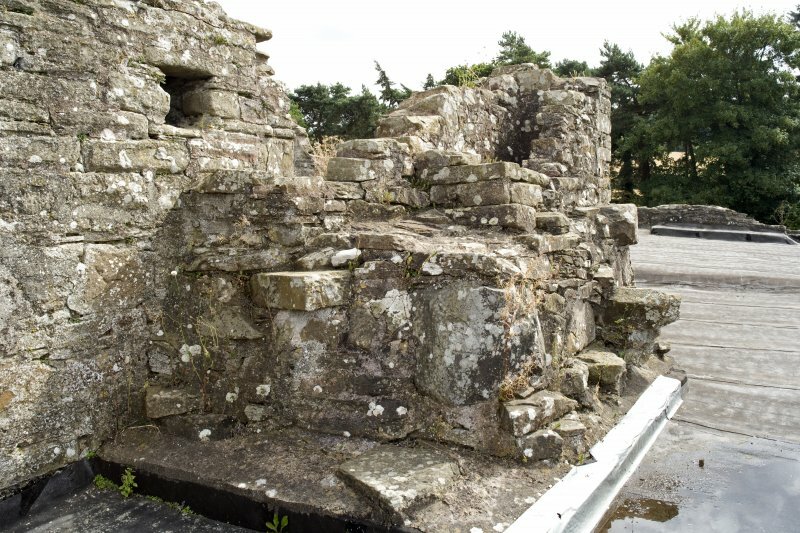 The foundation of a thick wall ran up to the south end of the west gable on the same alignment, which may be the remains of a precinct wall enclosing the outer court of the Monastery. 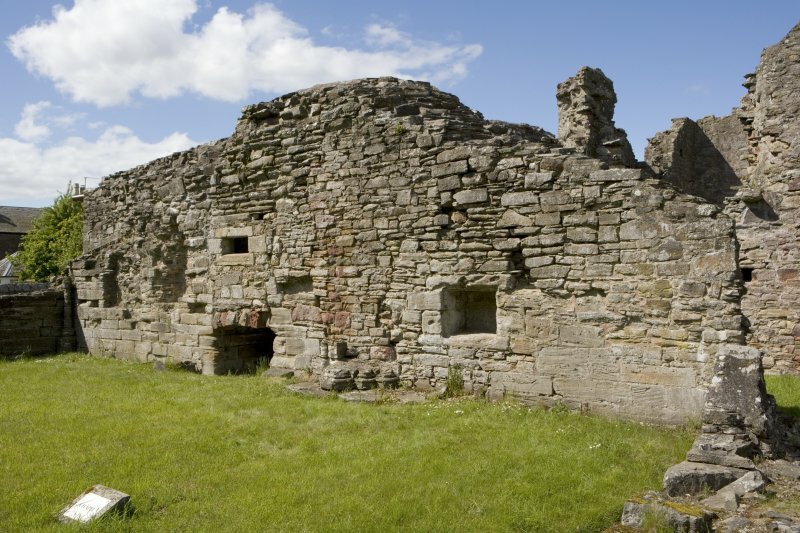 Scotia also excavated a corn-drying kiln, probably of seventeenth century date, in the east end of the barn. Information from ‘The Royal Commission on the Ancient and Historical Monuments of Scotland, Commissioners’ Field Meeting 2010'. 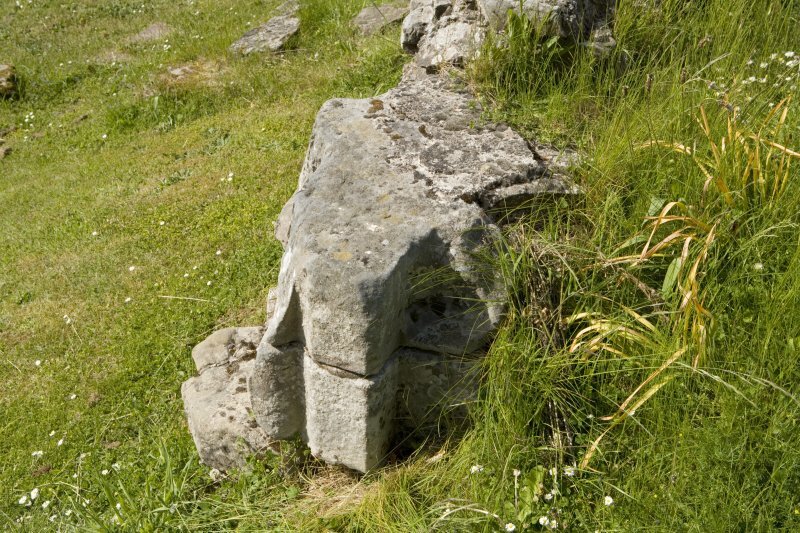 An Archaeological Watching Brief was carried out on 24th March 2011 in accordance with Scheduled Ancient Monument Consent ahead of the replacement of an interpretation panel. The work consisted of the demolition of an existing stone interpretation plinth and the excavation of two post holes in order that a new interpretation panel could be erected at the entrance to the Property. Trench 1 was located within the West entrance to the ruins of the Church, 5.5m east of the modern steps which allow access into the Nave. 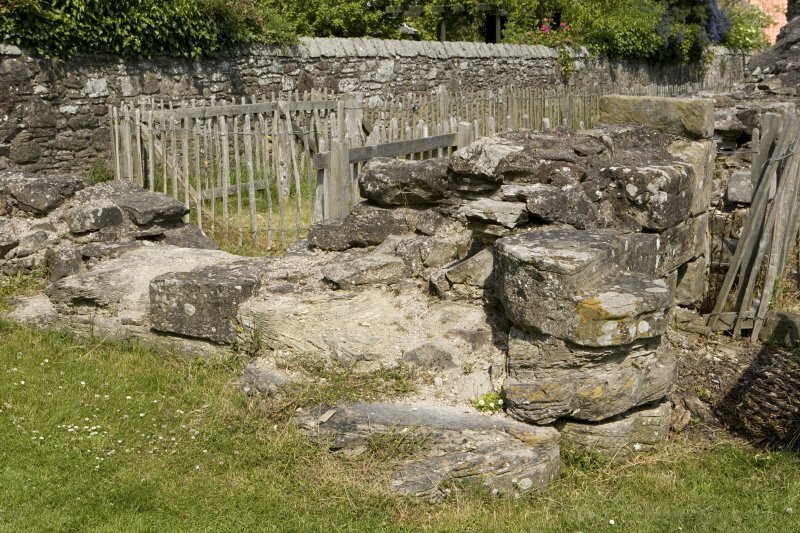 The Trench was the result of the removal of an existing stone plinth previously used to house the NTS interpretation panel. Upon its demolition and removal a shallow 0.23m deep cut remained. This cut measured 1.8m east-west by 1.20m north-south and extended no deeper than natural topsoil. As such, Trench 1 presented no archaeological material. Trench 2 and 3 comprised parallel rectangular postholes 1.05m apart on a east-west axis. 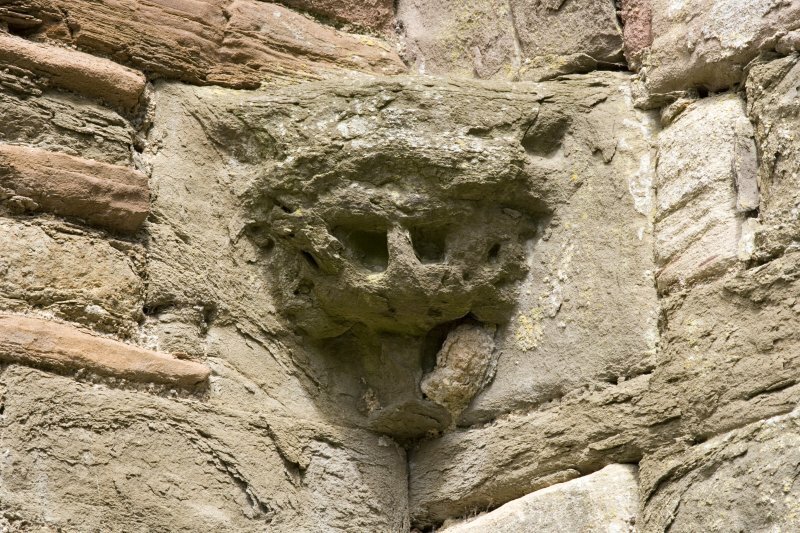 They were located c.6m south-east of the main western entrance to the Abbey. Trench 2 measures 0.35m by 0.30m in plan and Trench 3 measured 0.45m by 0.45m in plan. Both contained three sub-surface layers directly below topsoil . Context , directly below the topsoil consisted of a 0.15m thick mix of topsoil and small mortar fragments (less than 0.03m). Directly below this context  consisted of a 0.27m thick mid-brown silty clay and below this was context , a natural gravel consisting of water rounded pebbles (less than 0.03m in size). Context  was excavated to a depth of 0.45m below context . In all, the two post holes were excavated to depths of 0.90m.